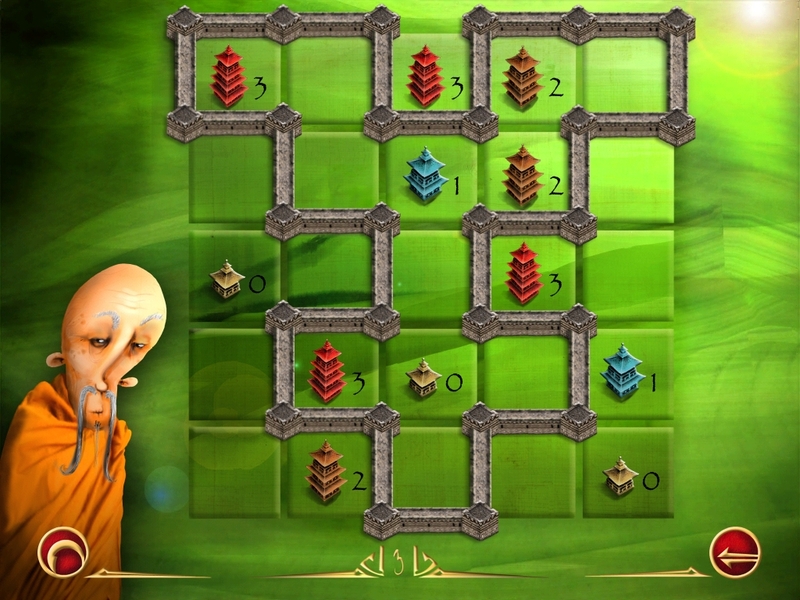 There are eight cities to visit in IQ Mission, meaning there are eight games to play in all. 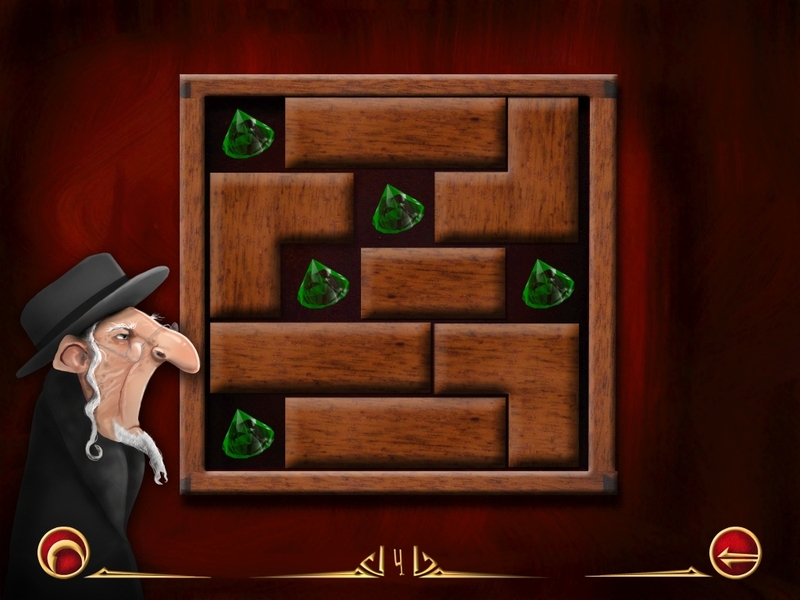 You can scroll through and choose games as you like, hopping back and forth when one gets too intense to handle. 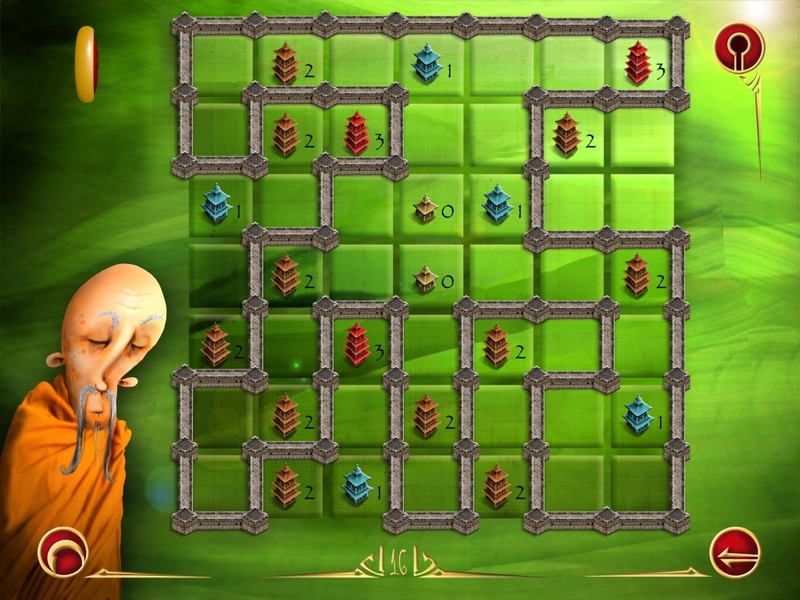 You start with a simple sliding game where you push moai statues across a grid. 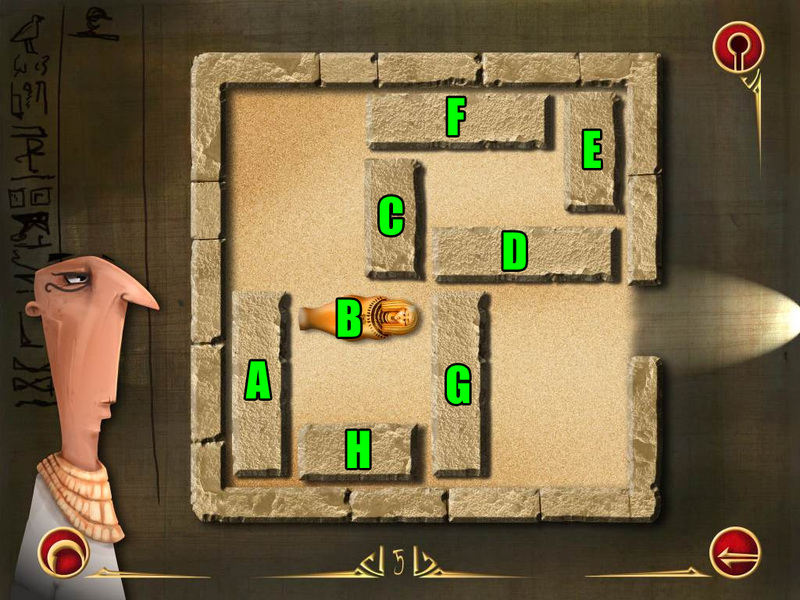 From there, you can play an Egyptian version of the traffic game, a tangram-style block arranging puzzle, a dice game, a wall building game similar to Slither Link, and a very unusual "copy the picture" puzzle in Paris. The games, while recognizable at their base, are actually quite unique and present a great level of challenge, even for seasoned puzzle solvers. 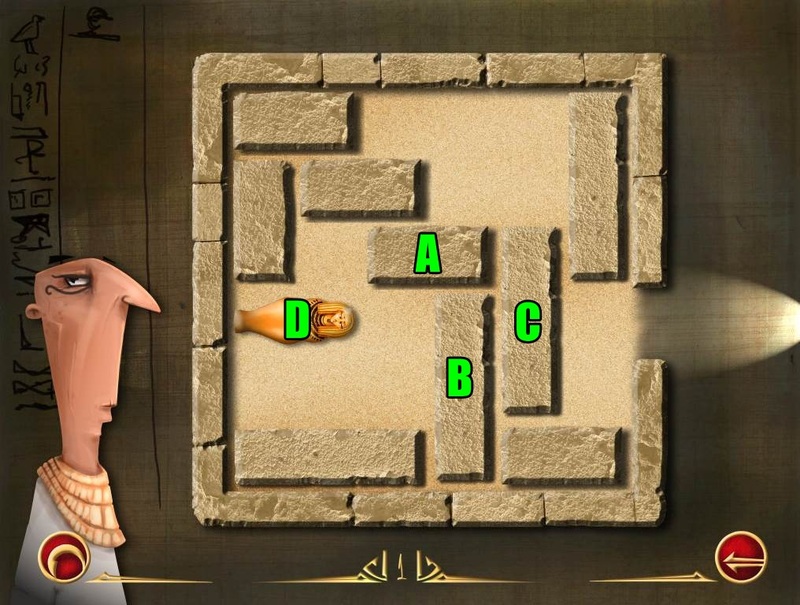 IQ Mission looks fantastic, with dark and moody games presented by some crazy characters from each location. 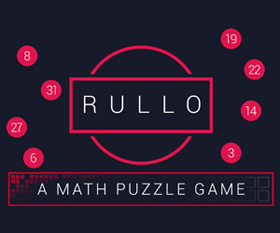 It's rare to see a serious brain game go for anything beyond a minimal color palette and a crisp Helvetica font, but you'll be pleased as pallium to see the attention to detail and aesthetics here. And beyond the pretty images on your screen, the game itself is filled with 120+ stages that are genuinely challenging to complete. 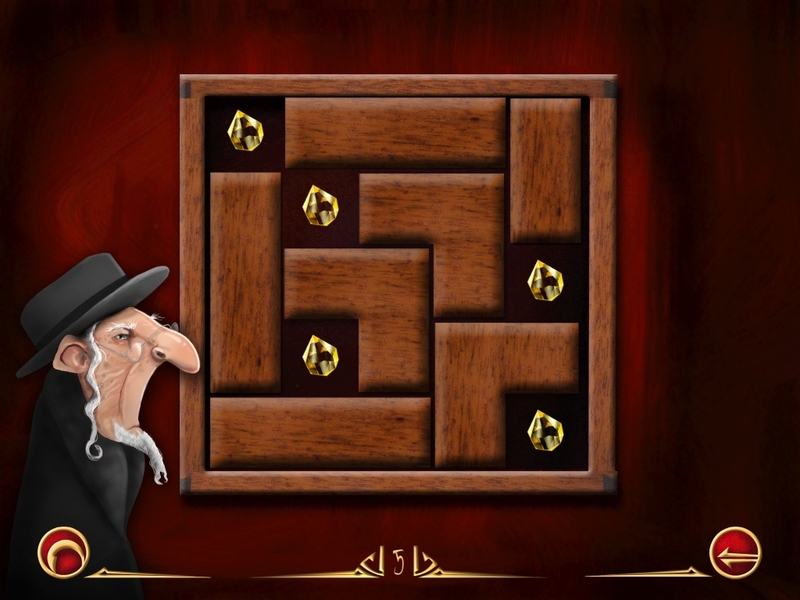 All in all, a fantastic mobile puzzle game you won't regret trying! 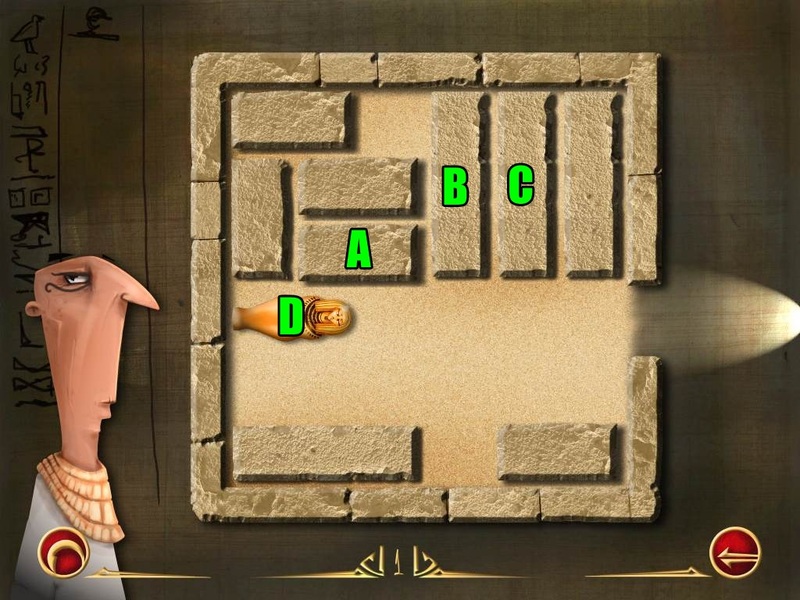 IQ Mission Walkthrough now available! For the IQ Mission Epilogue walkthrough, go here. 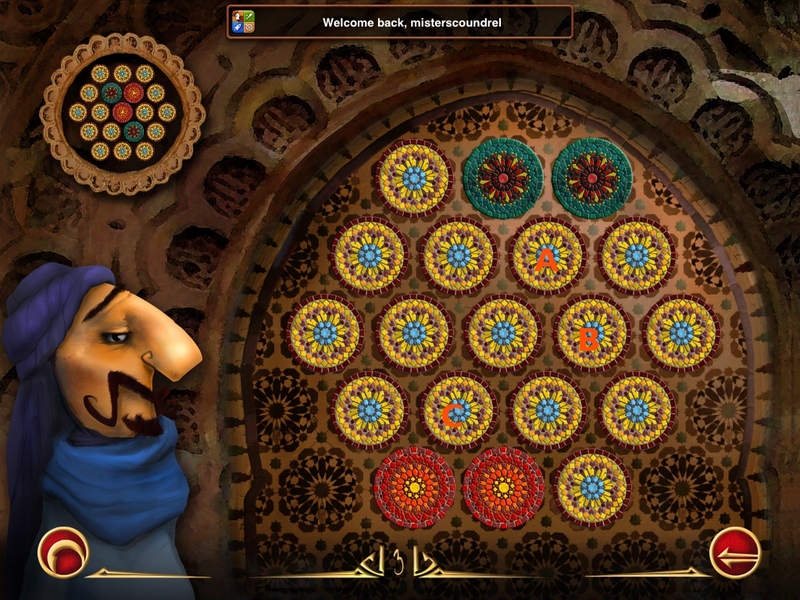 The main menu gives you your choice of which city you wish to play. 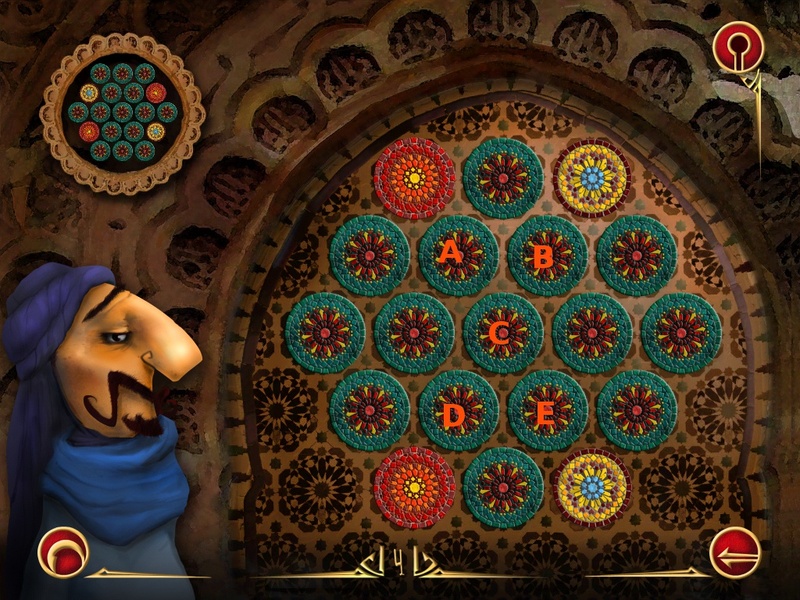 In addition, you can turn the sound and music on or off, and view the game credits. 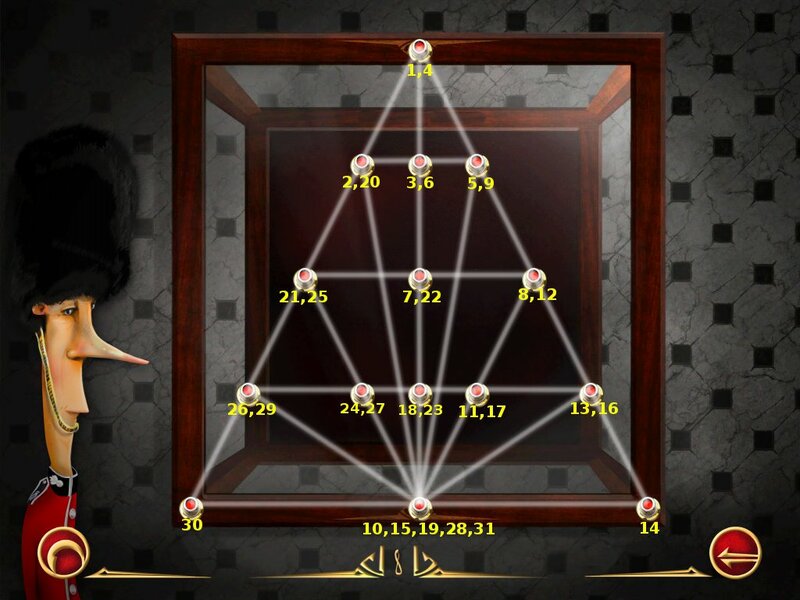 The telephone in the middle of the screen is a link to the App Store if you wish to purchase the IQ Mission Epilogue game. 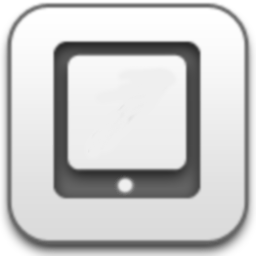 The icon in the lower left corner will take you to the Map. 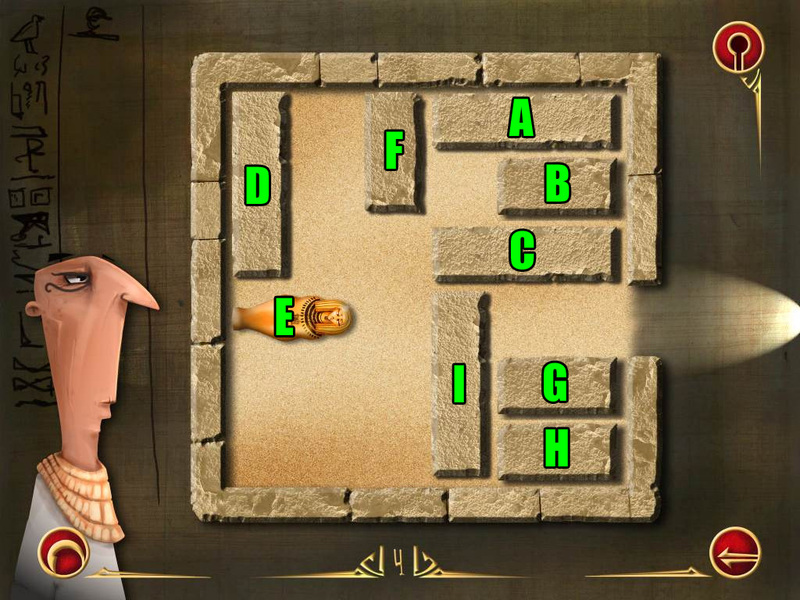 Your goal for the game is to collect the 8 pieces of a Map that has been split up by members of a secret brotherhood and hidden in 8 different cities around the world. 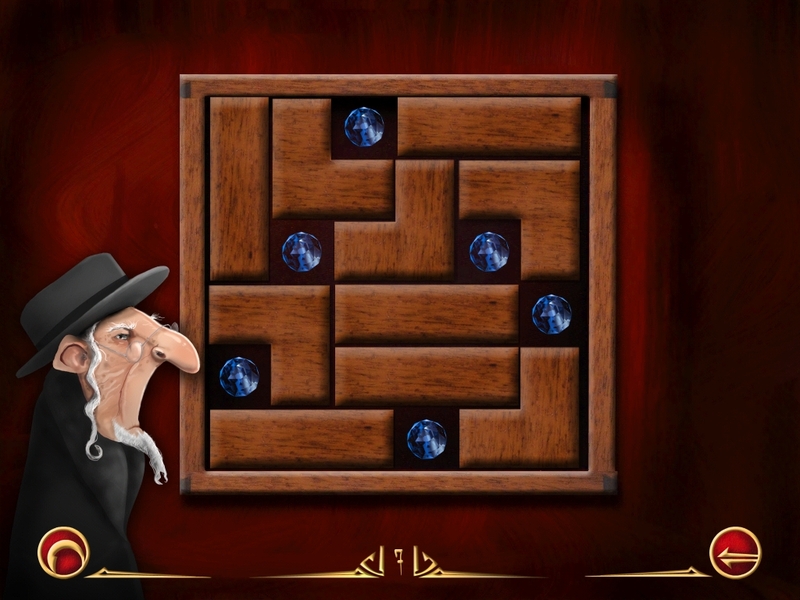 When all the missions are completed, you will need to complete the Map Puzzle in order to reveal the secret source of the Earth's energy that is needed to save humanity from destruction. There are 16 levels for each city, and you must complete the levels in numerical order because the completion of one level will unlock the next one. 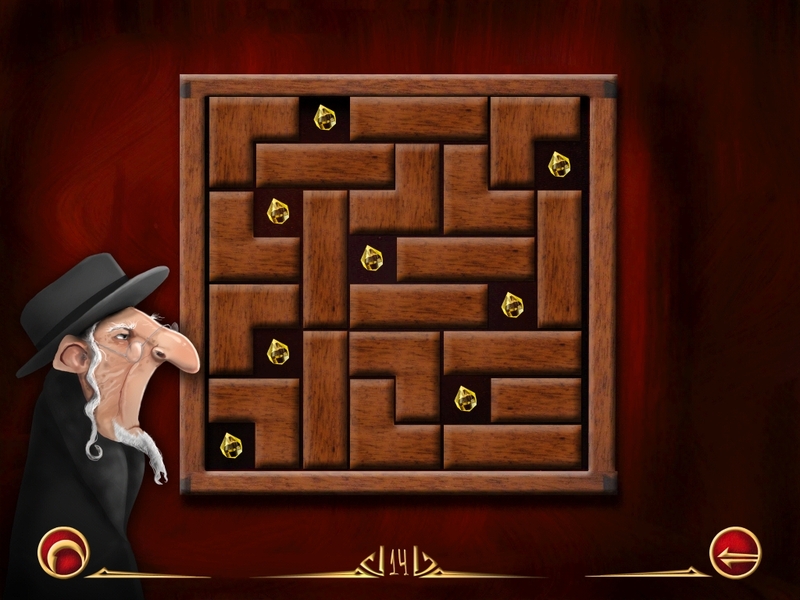 The icon at the upper right will link you to a screen that will let you buy a hint key for the game, but you can also just use this walkthrough. 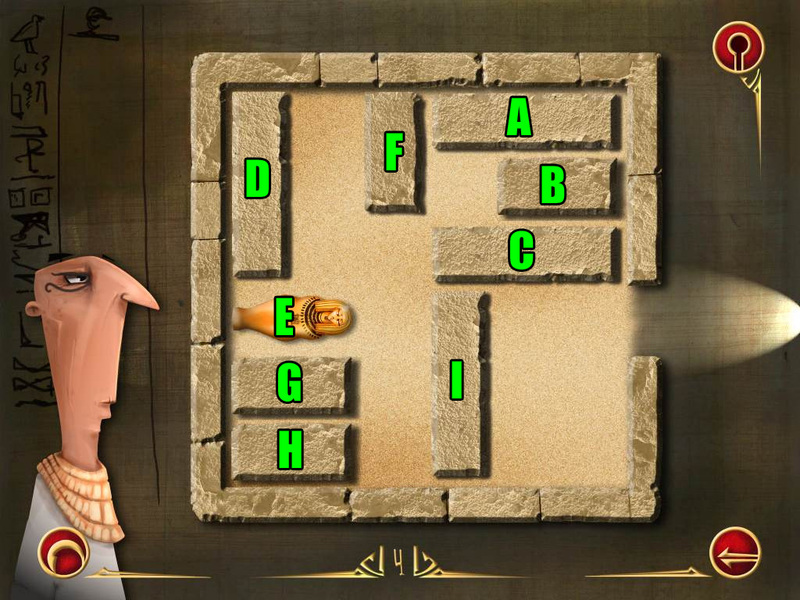 The solutions shown in the screenshot of this walkthrough are ones that are known to work but may not be the only solution for that level. 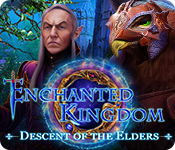 The following is a list of the Achievements you can earn throughout the game. 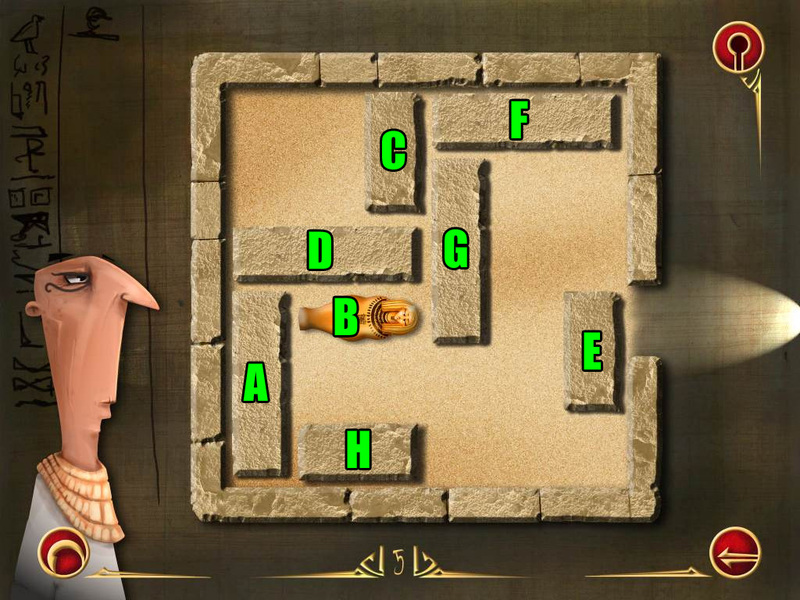 The Search Hunter: Collect all the sacred scarabs hidden among the stone blocks of Hatshepsut's tomb. 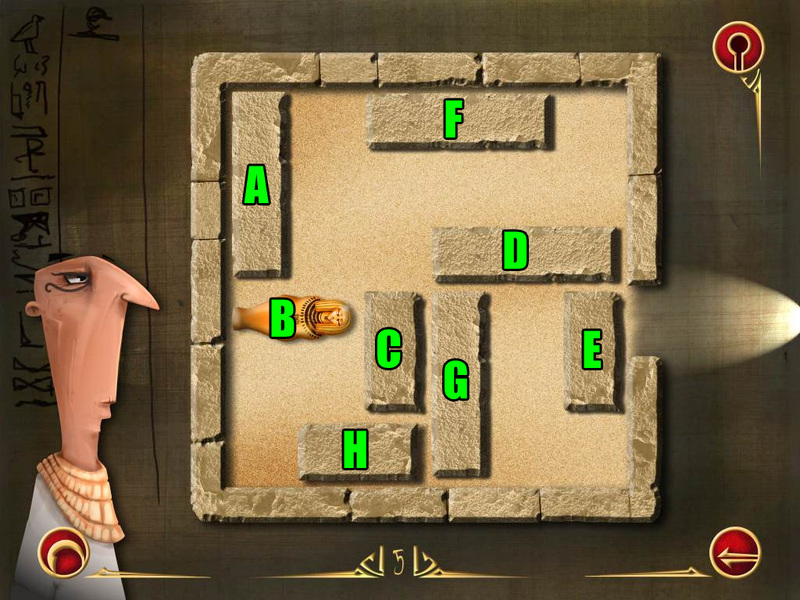 The Touch of Osiris: Move all the elements you can find in the pharaoh's tomb. 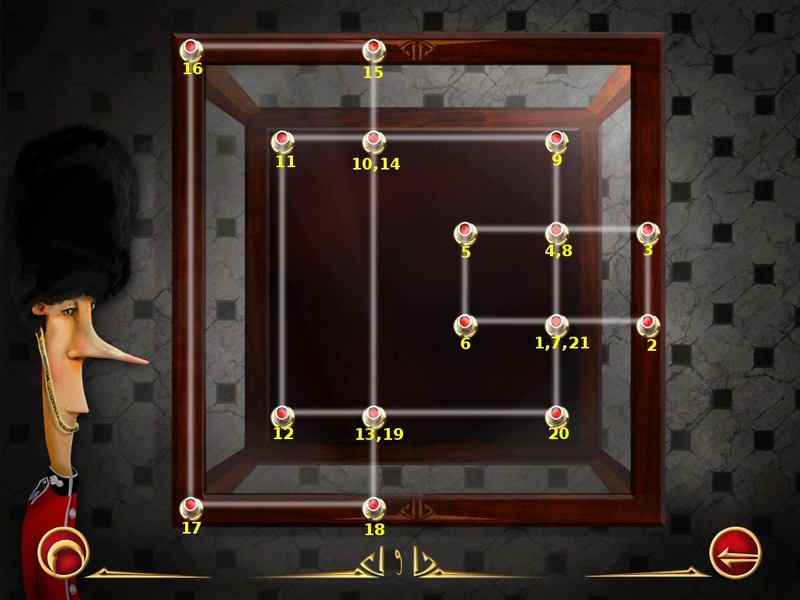 The Grace of the Nile: Complete the entire Luxor mission. 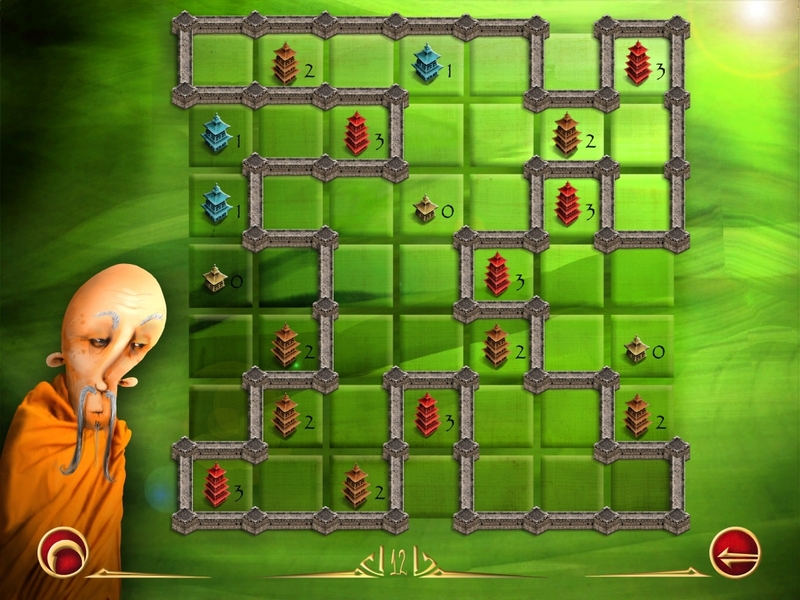 The Consolation of the Unfortunate: Use all the possible moves of the dice in such a way as to not reach any destination. 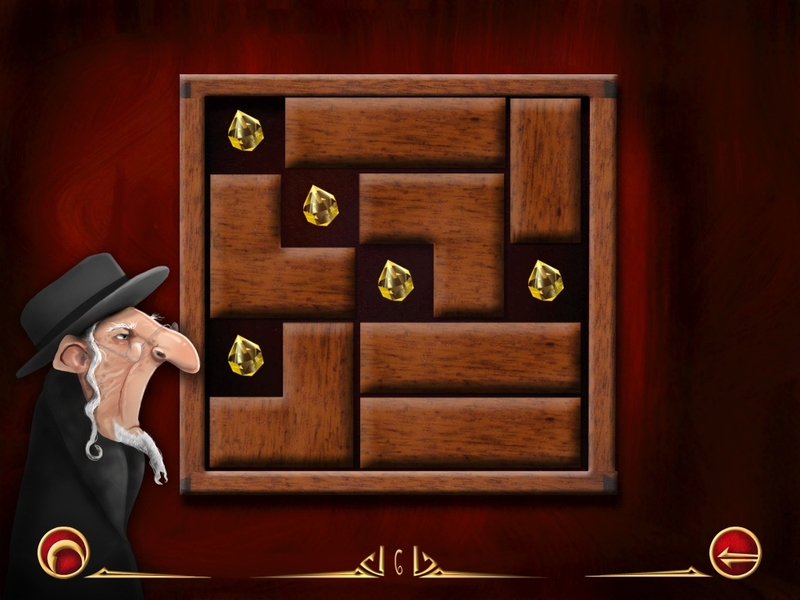 Mister Orderly: Place three dice with 2 spots next to each other in a vertical line. 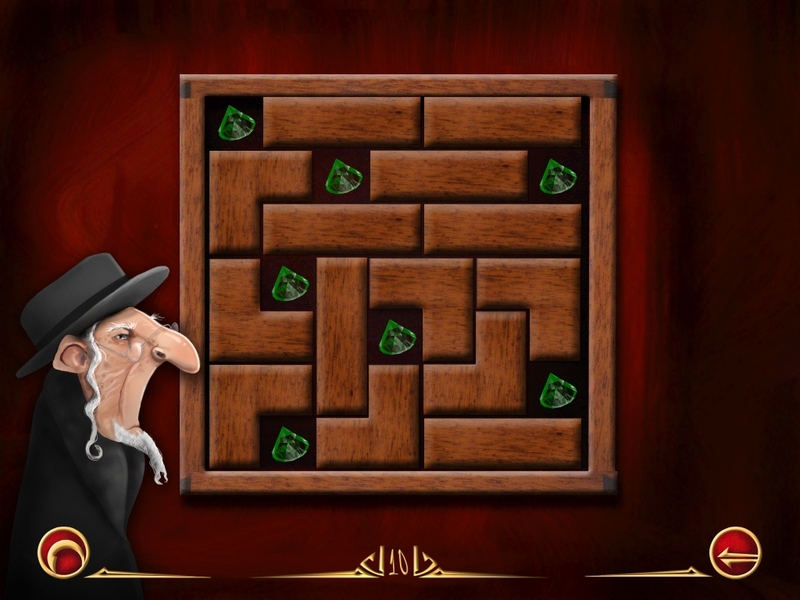 Casino Shark: Complete the entire Monte Carlo mission. The Glitter of the Heart of Eternity: Find the Hearts of Eternity in one of the caskets. 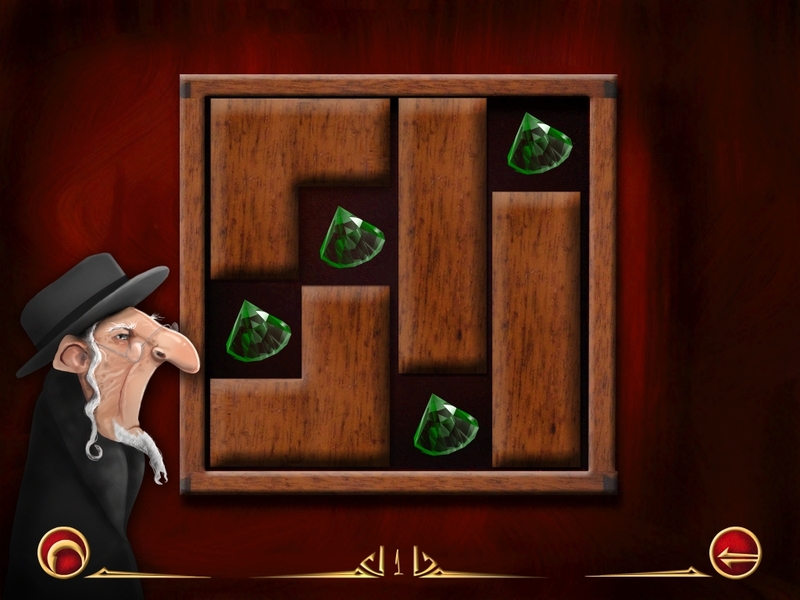 The Master of Diamond Cutting: Rearrange the casket twice, once with diamonds of one color, then with diamonds of another color. 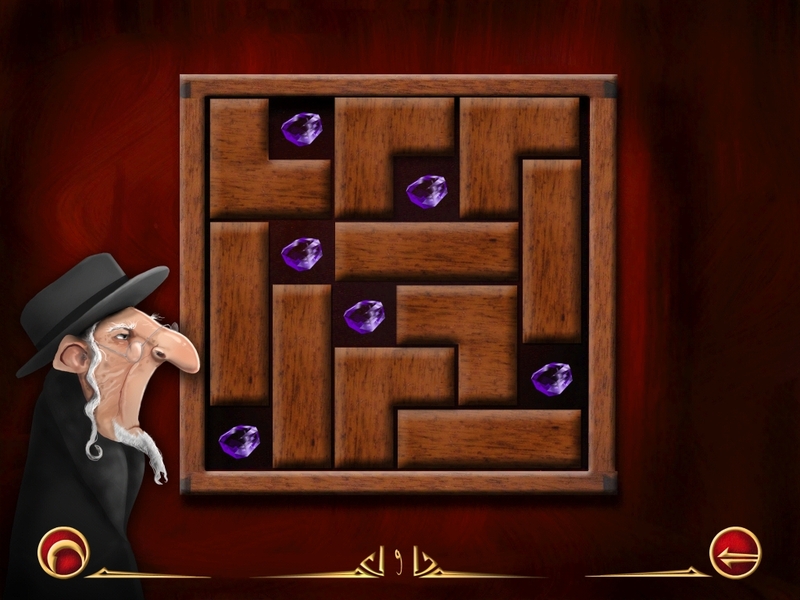 The Final Cut of the Diamond: Complete the entire Antwerp mission. 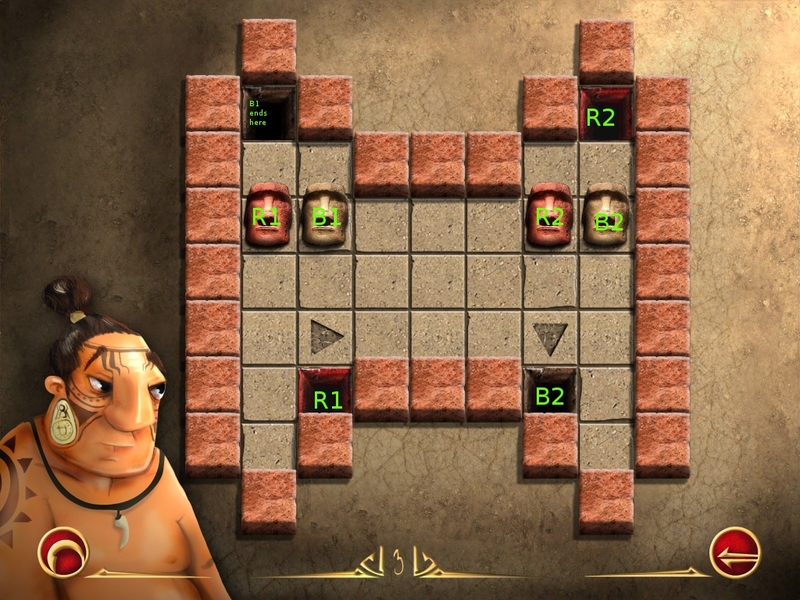 The Saviours of Rapa Nui: Complete the entire Rapa Nui mission. 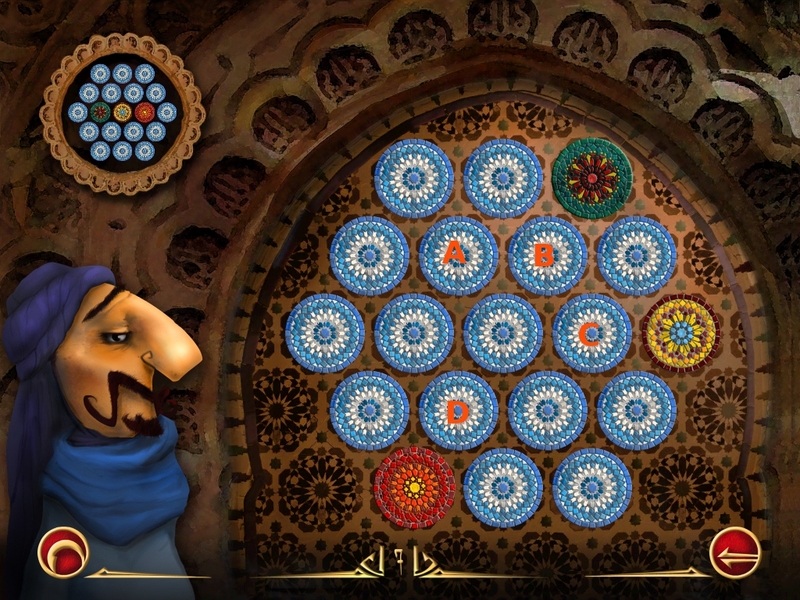 The Wonder of Countability: Arrange an arabesque in 4 moves. 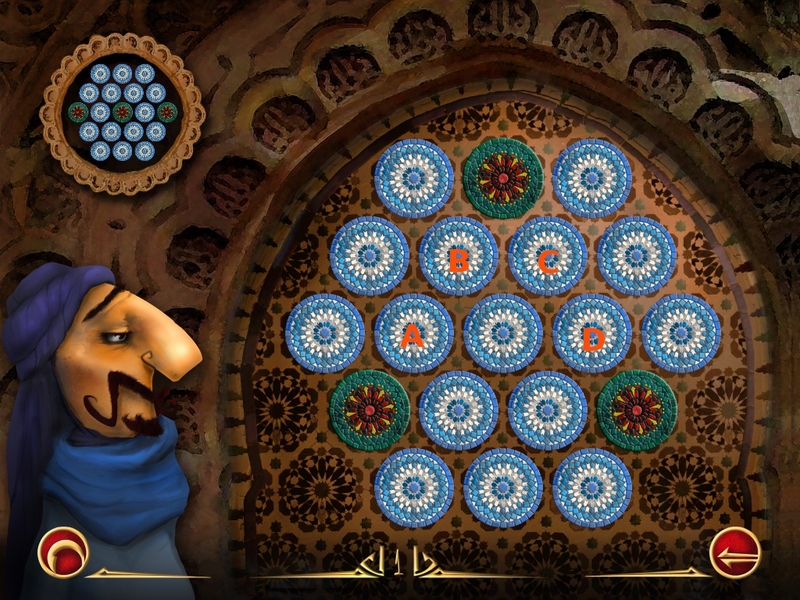 The Arabesque Artist: Complete the entire Marrakech mission. 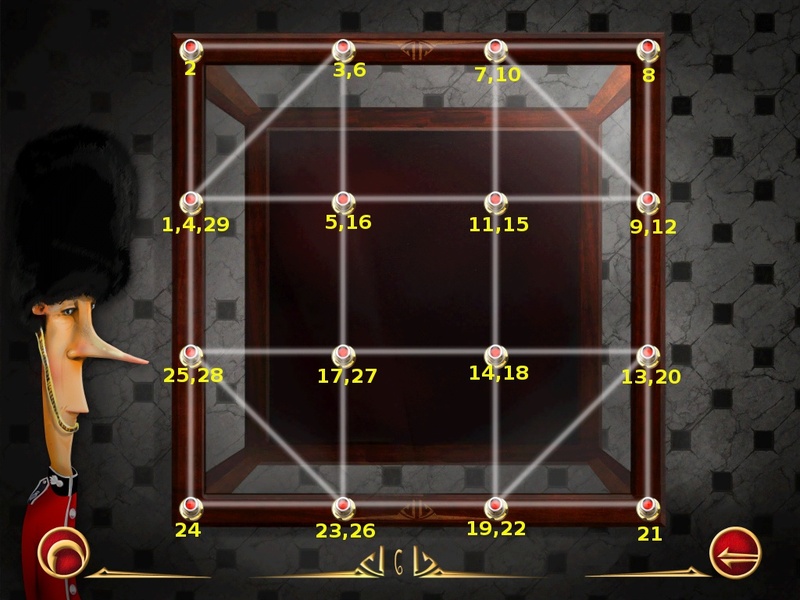 The Beneficial Providence: Create a stained glass pane using all the elements given. The Perfect Copy Maker: Complete the entire Paris mission. 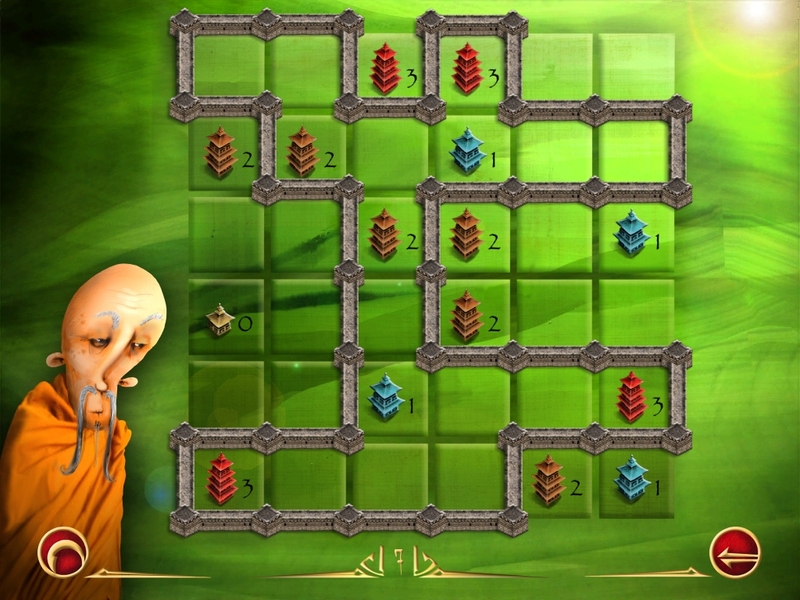 The Infallible Builder: Build a wall without making any corrections. 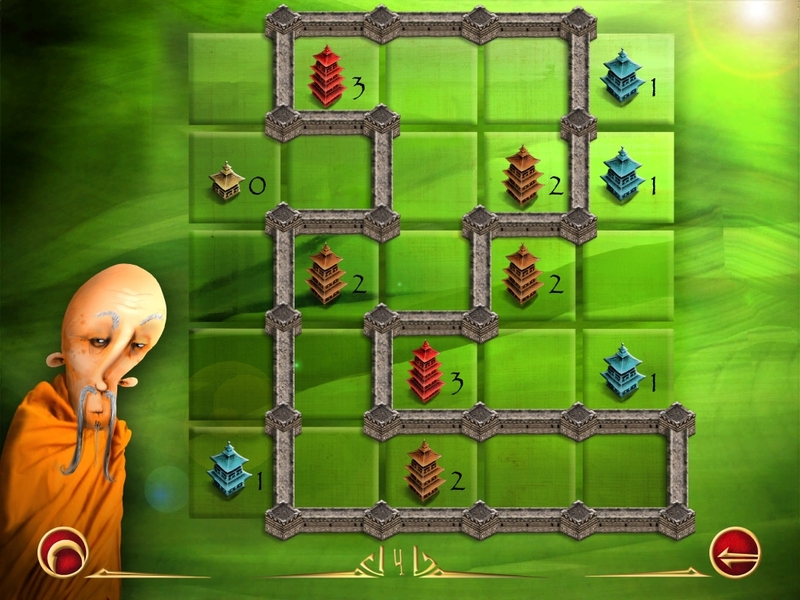 The Divine Sign: Build a wall in the shape of the Tian character. 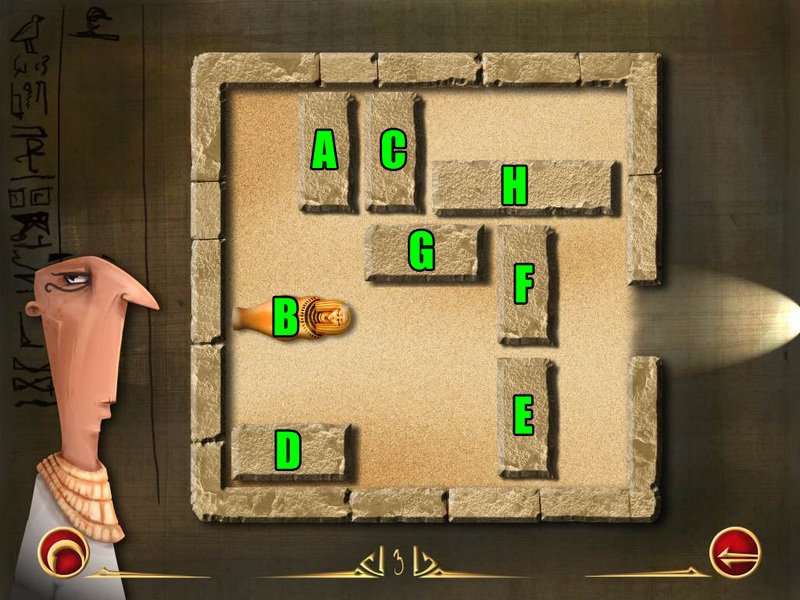 The Persevering Stone Mason: Complete the entire Beijing mission. 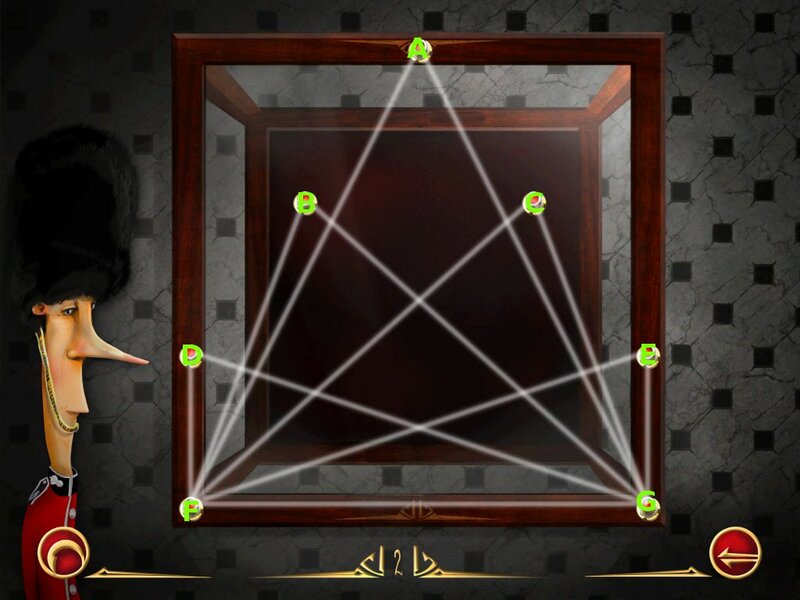 The Winner of Insignia: Find the royal insignia among the laser rays. 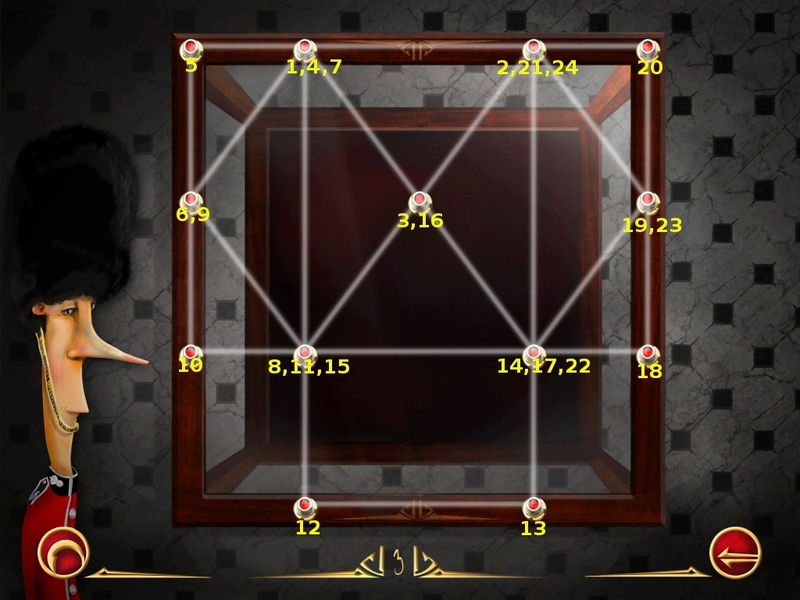 The Royal Laserologist: Complete the entire London mission. 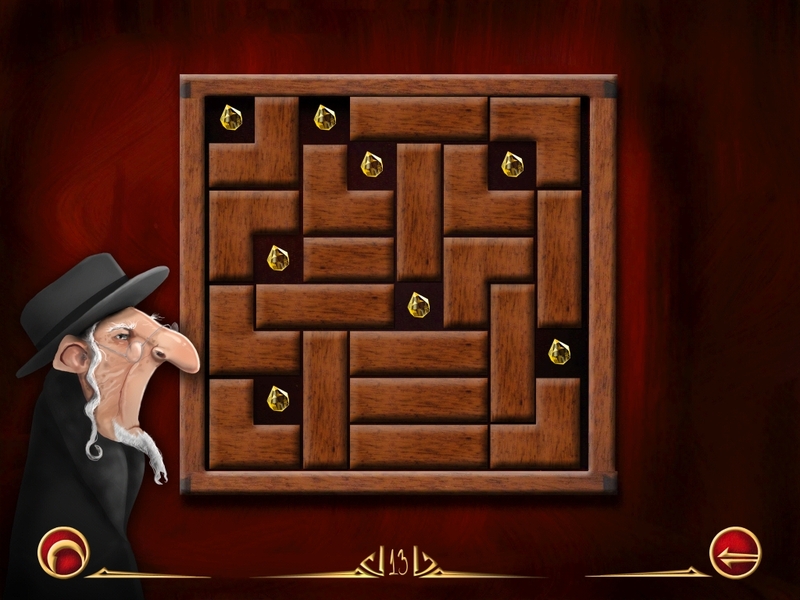 The Golden Mind: Complete the entire IQ mission. 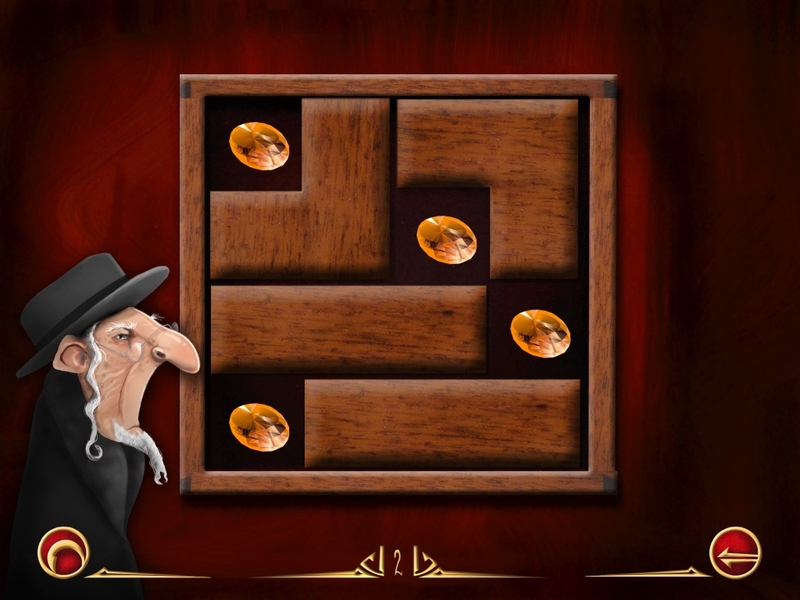 In order to charm Aaron Goldbaum into giving you his piece of the map, you will need to help him organize his cases of precious stones. You need to cover the diamonds in such a way that only the diamonds of the same color can be seen. 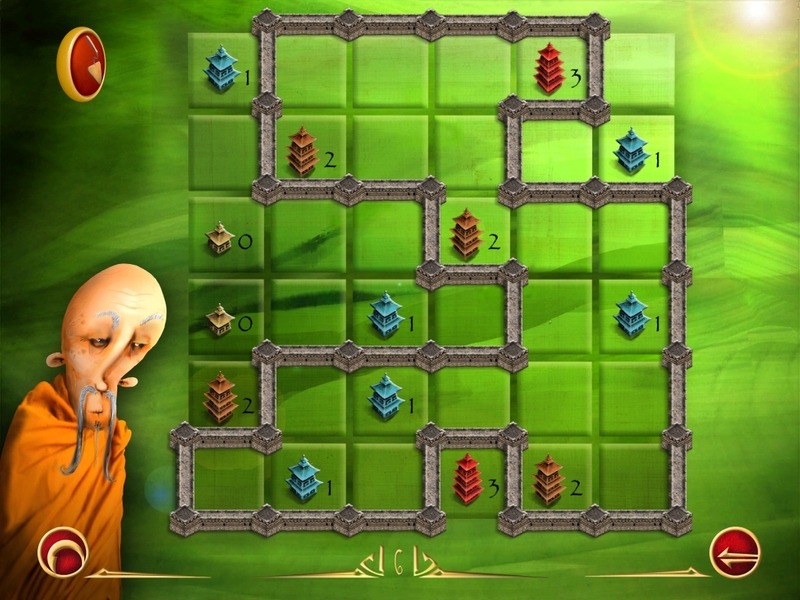 Use the wooden blocks, located on the right of the scene as the cover. 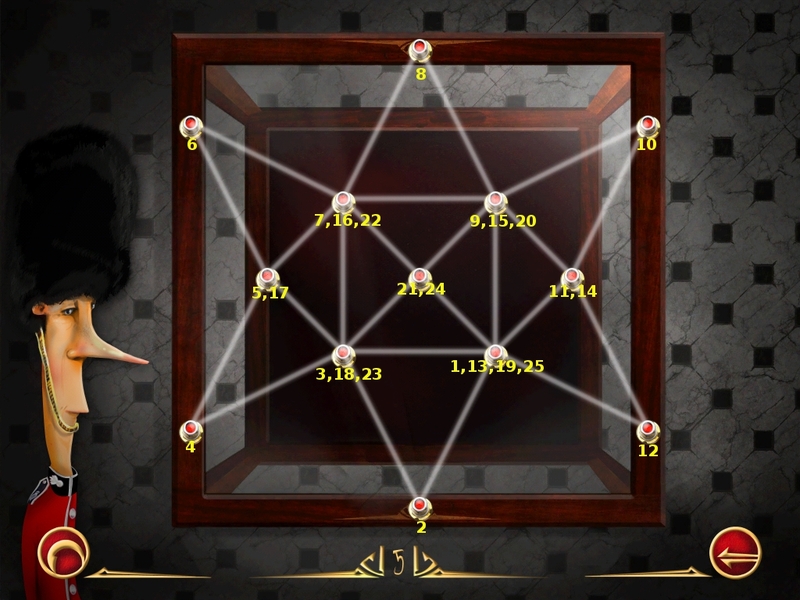 You can rotate a block by tapping on it once it is placed on the board and then place it as shown in the screenshots. Keep the green gems showing. Keep the orange gems showing. Keep the pink gems showing. Keep the yellow gems showing. Keep the blue gems showing. Keep the purple gems showing. 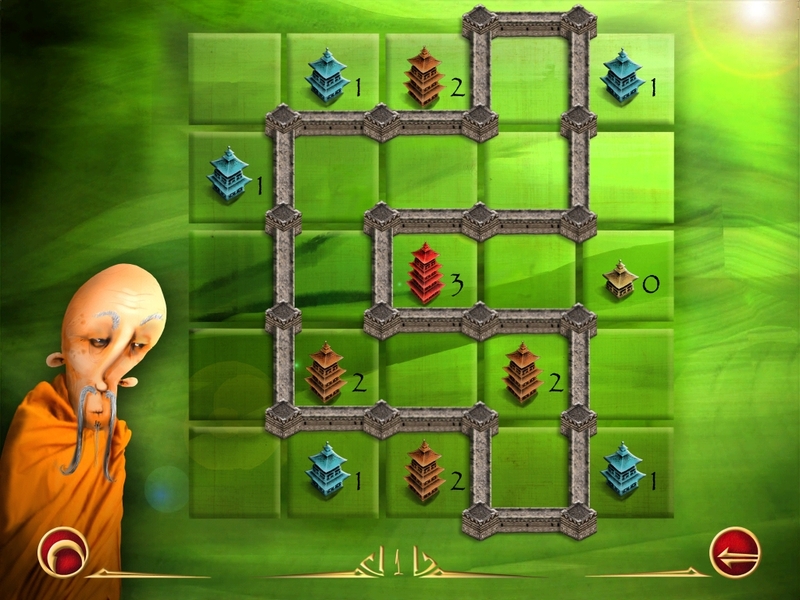 Lin Zi will give up his map piece if you rebuild the wall between the observation towers. The most important thing to remember is that your wall must be closed, and you cannot create loops. 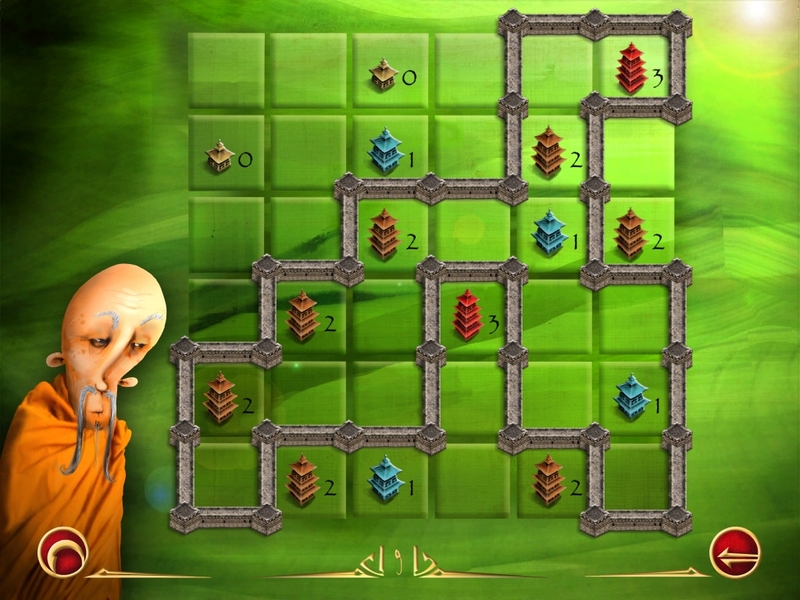 Each tower should be surrounded by as many sides as the number shown on the tower. Bob Atkins is requiring you to connect all of the laser beams. In order to do so, you need to touch each connection of the beam to show it where you want it to go. 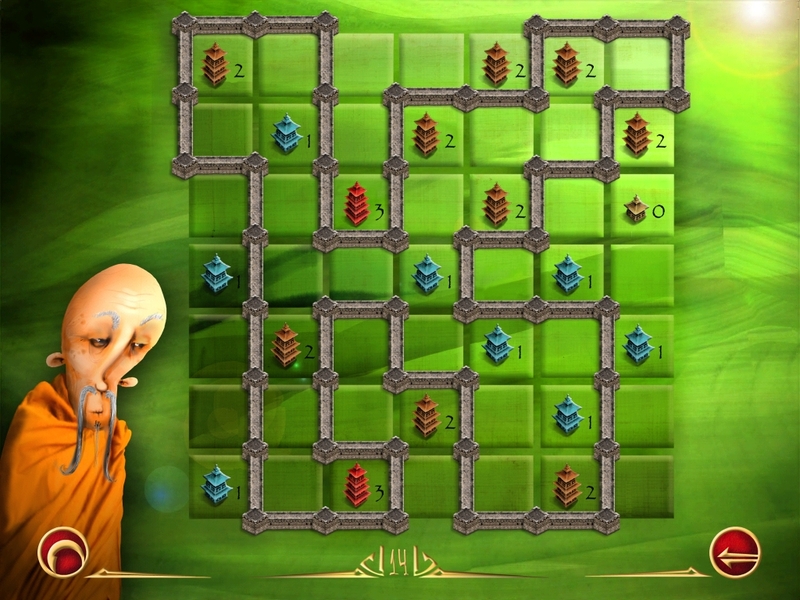 You cannot cross paths, so you must follow the paths shown in the screenshots to complete your journey. 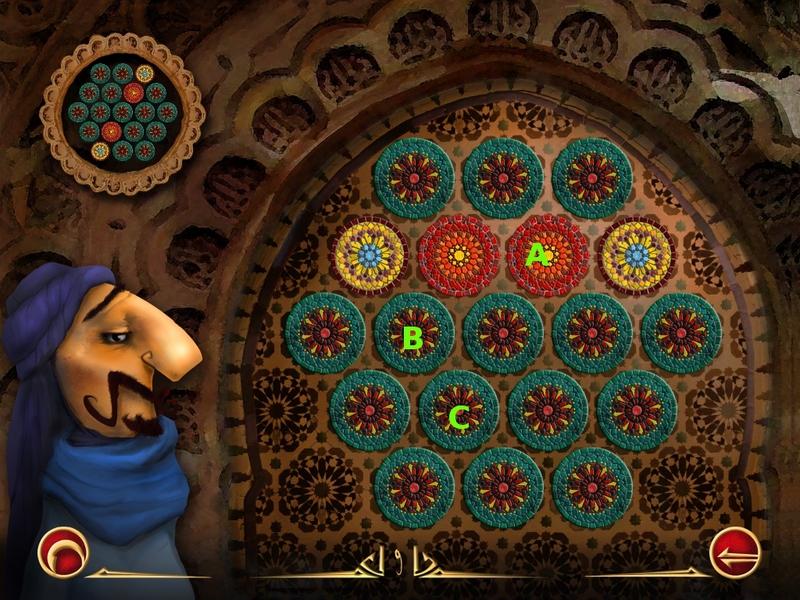 Refer to the screenshot below and press the buttons in numerical order. 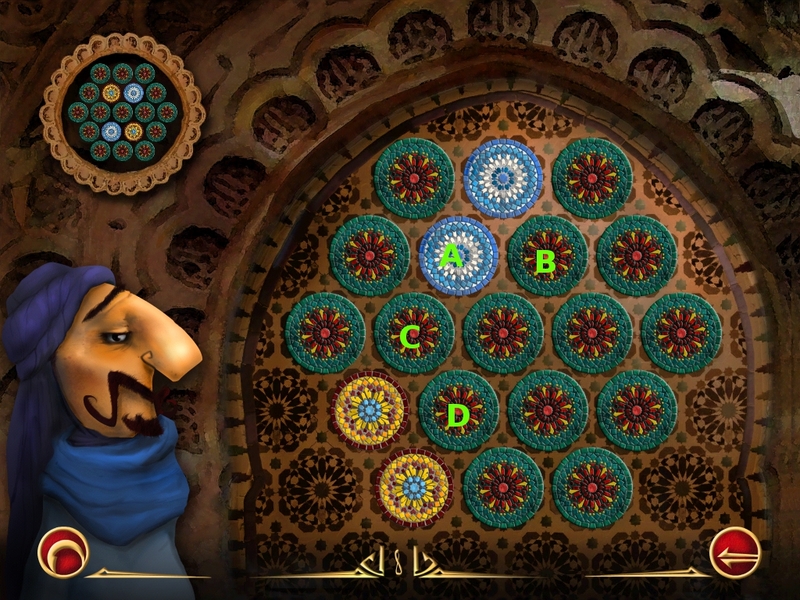 Refer to the screenshot below and press the buttons in the numerical order. Hapusenab made an oath to his Queen that he would make sure her soul found its way to Osiris, the lord of the dead. 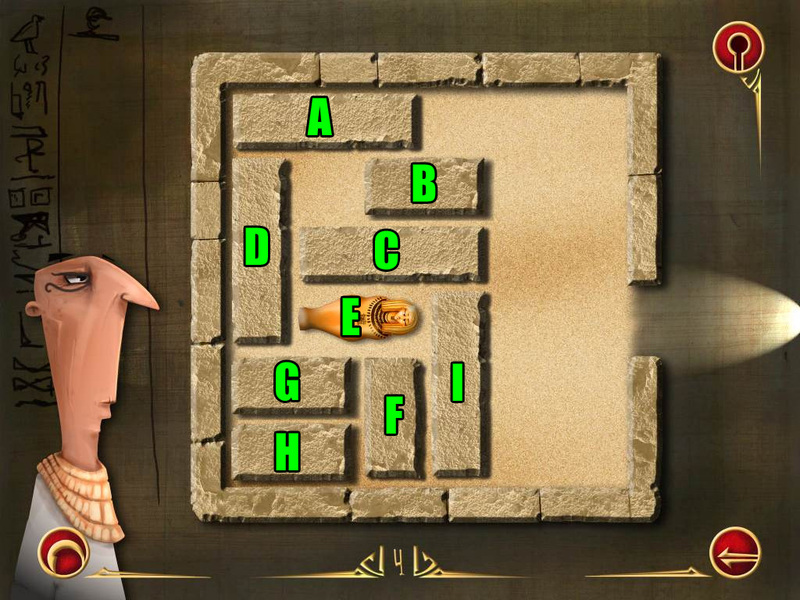 In order to help him make this happen, you will need to solve the slider puzzles to make a route for him through the stone blocks to move her sarcophagus out of the tomb. 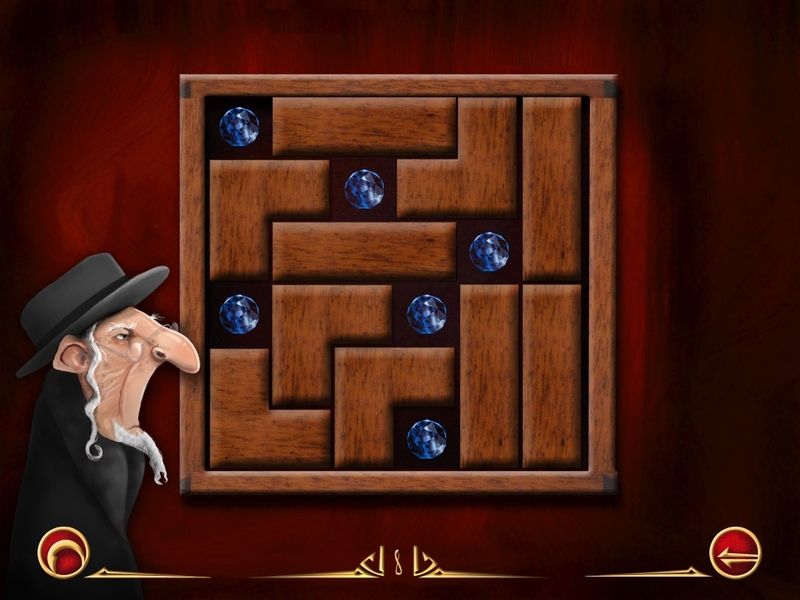 The blocks only move right and left and up and down, so see the screenshots for the solutions. Slide Block A to the left. 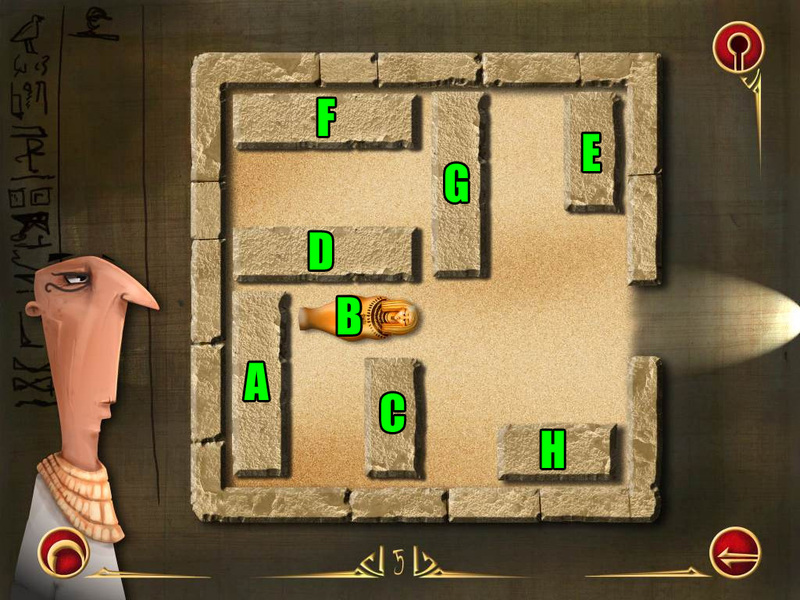 Slide Sarcophagus D right to complete the puzzle. 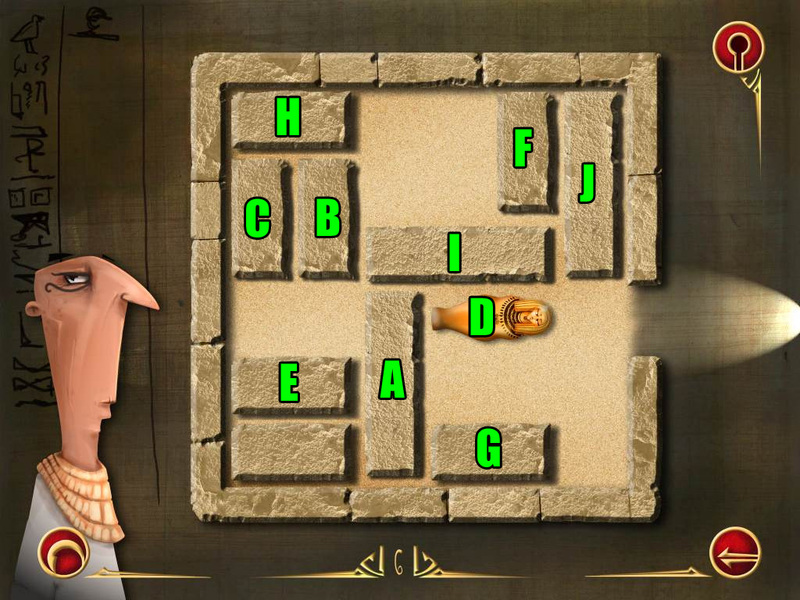 Slide Sarcophagus G right to complete the puzzle. 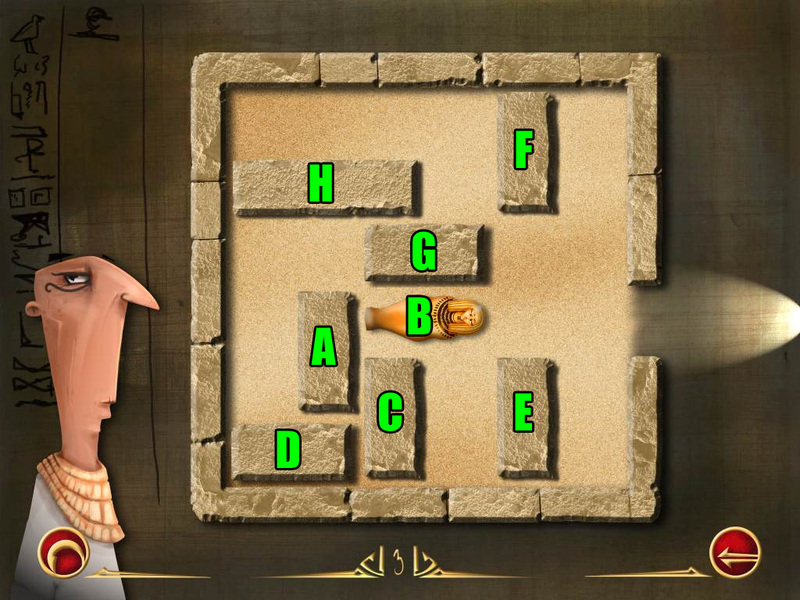 Slide Sarcophagus B right to complete the puzzle. 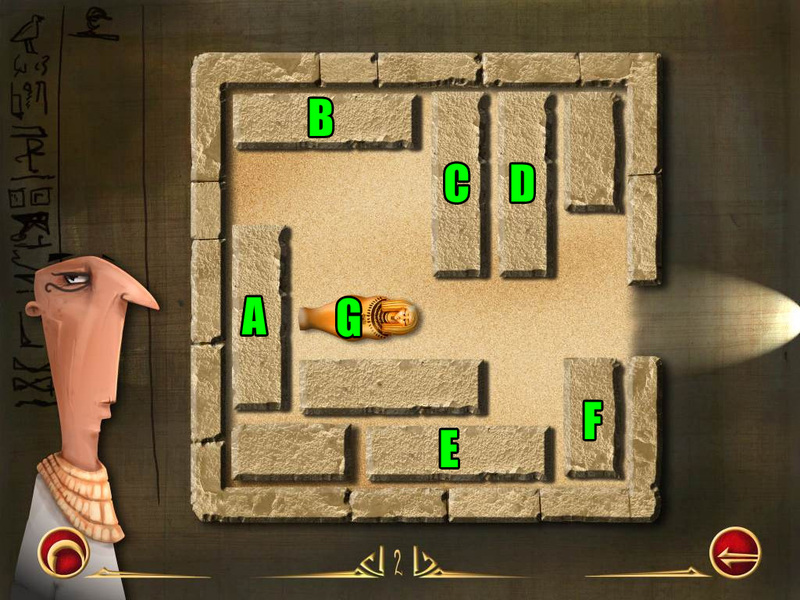 Slide Sarcophagus E right to complete the puzzle. Slide Block E down, one space away from the bottom. Slide Block Sarcophagus B right. 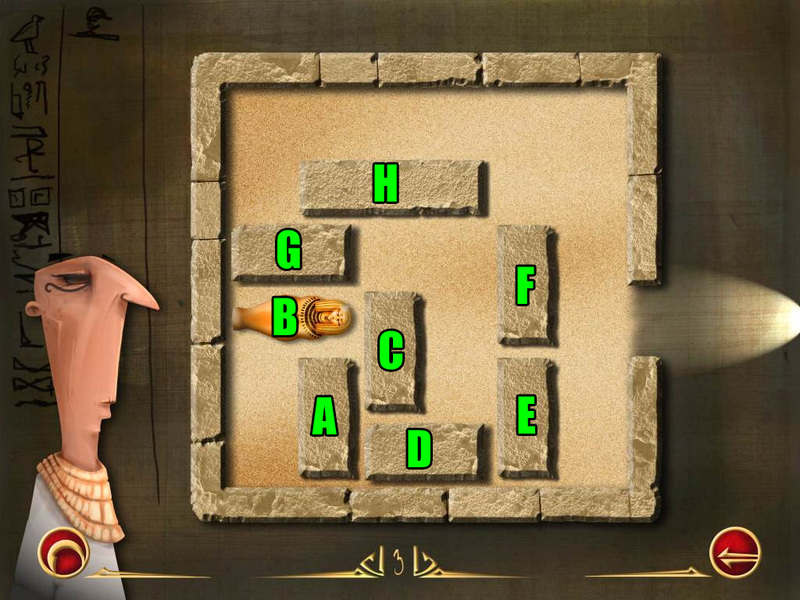 Slide Block Sarcophagus B right to complete the puzzle. 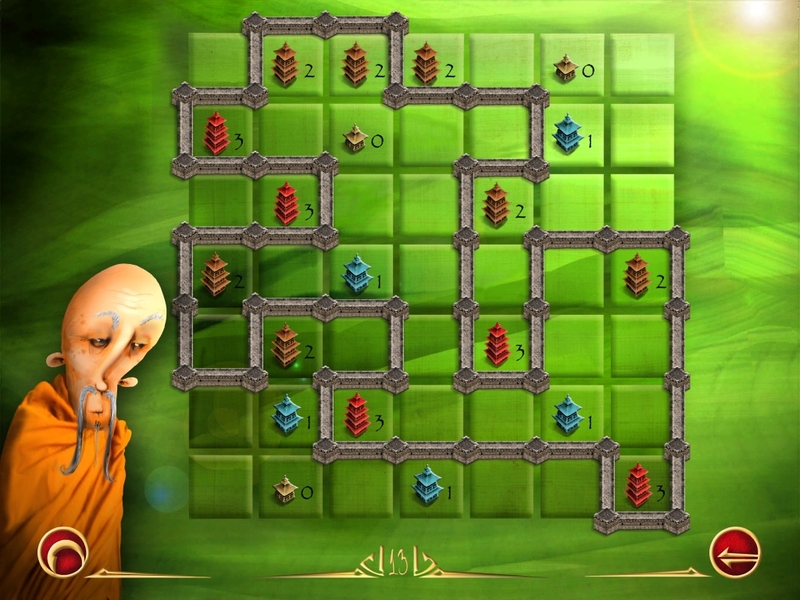 Slide Block H right to the middle of top row. Slide Sarcophagus D one space to the right. 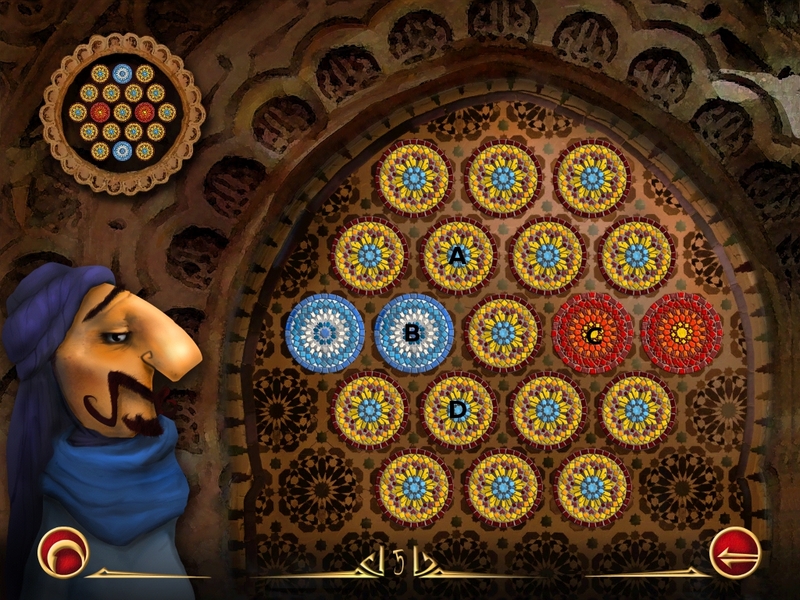 Mohammed Ben Karim wants you to restore all of the arabesques to their original design, and then he will give you his map piece. 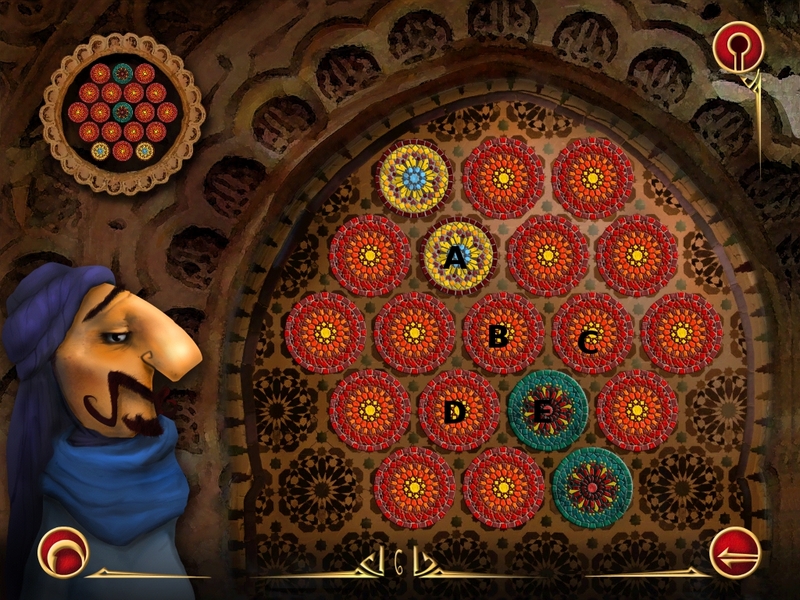 You will need to move the circular elements of the arabesque in order to move the highlighted pieces to match the sample. 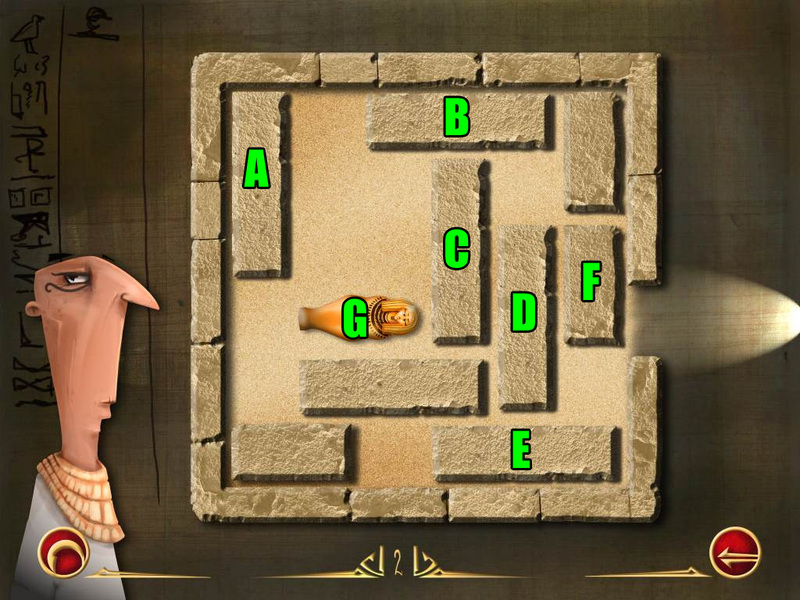 Keep in mind that there are various circulars in the design, so check the screenshots for the solutions. 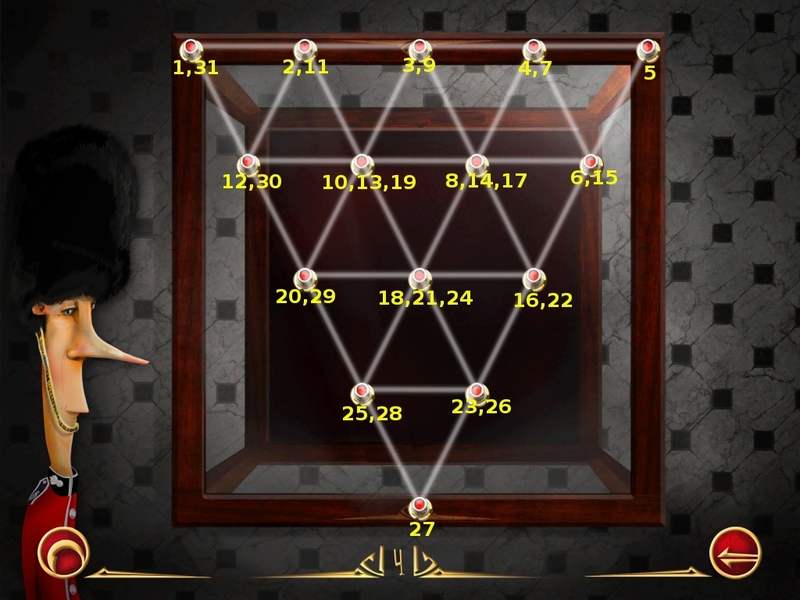 Colette and her sisters of the Order of St. Augustine are praying that you can reproduce all of the patterns perfectly to complete this mission. 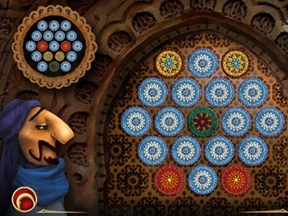 You must choose the shapes you need from those shown under the blank stained glass, then you need to drag them to the gray section of the circle to arrange them. Note: All solutions given from the middle of the circle outwards. 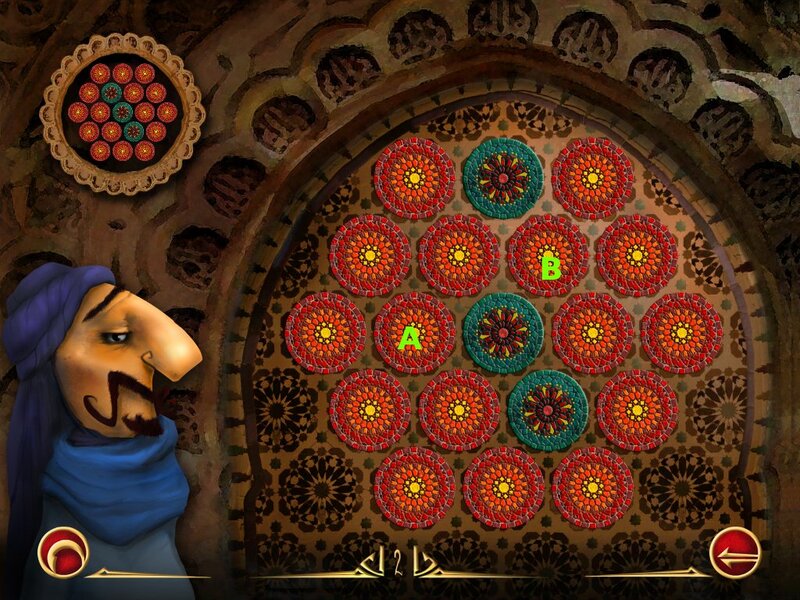 Alignment is important in this puzzle. 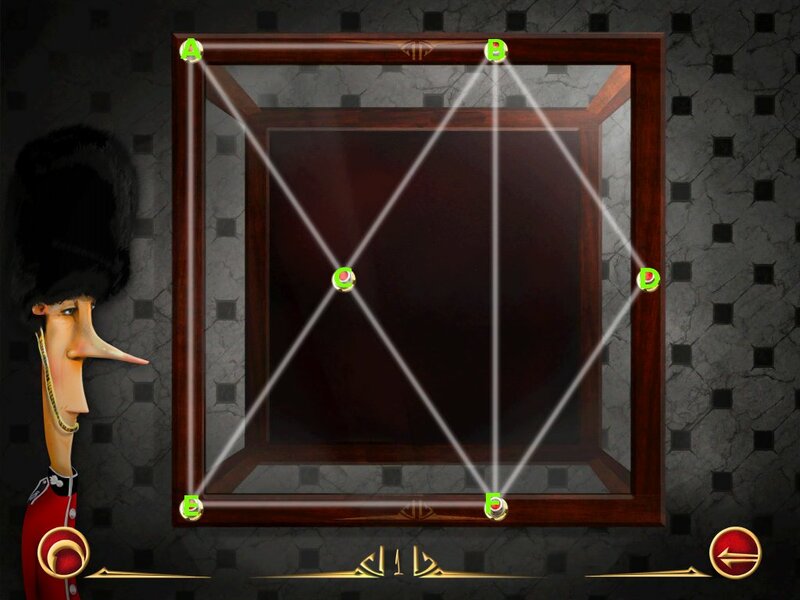 You may have the shapes and colors correct, but if the tip of a triangle is pointing at 4 o'clock instead of 3 o'clock, you will not pass the level. Some times you just have to fiddle with it until you get it exactly right. Note: Although the red shows in the middle, it's easier to put the grey circle first. Note: You may have to adjust which goes on top of what by tapping. 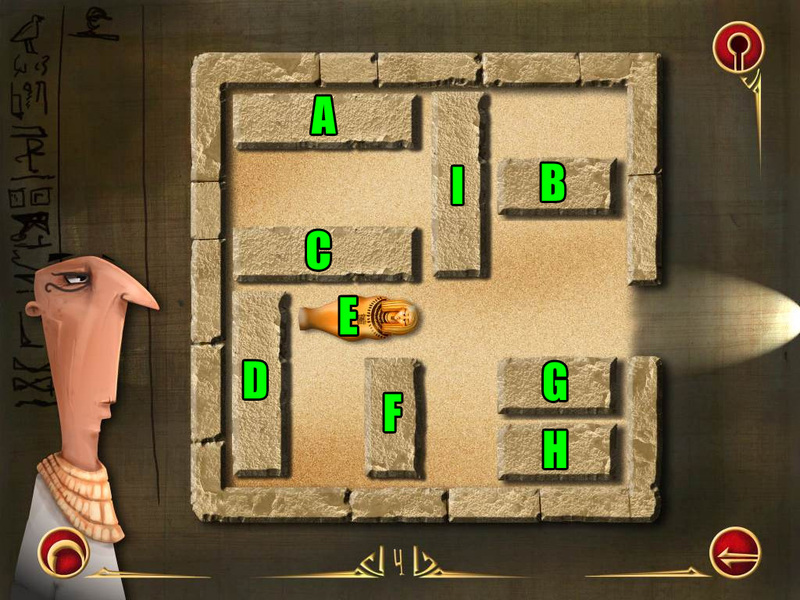 Uru Kenu is your host for this city, and he needs you to position all the statues (moai) in just the right places. You can move the moai either horizontally or vertically. 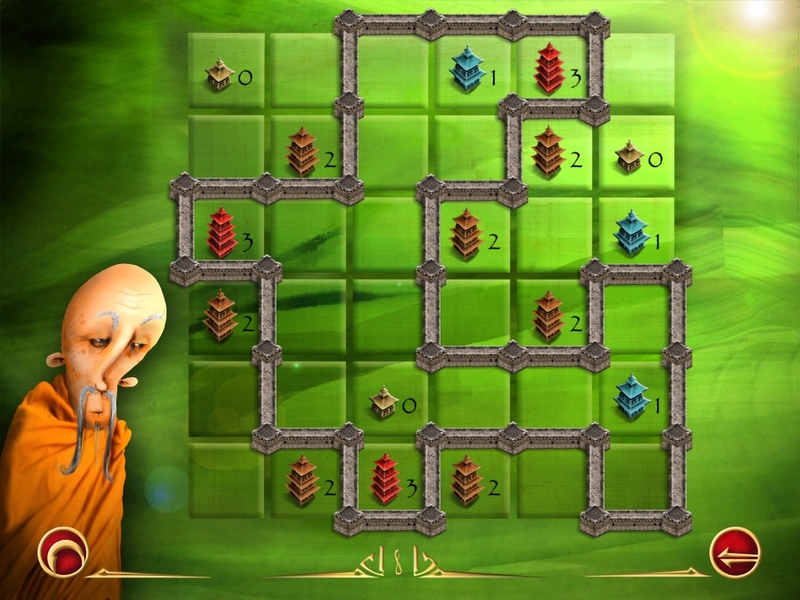 Once the statue is in motion, it can only be stopped by the boundary of the board, a stone barrier, or another statue that is not in its final place. Be careful that you do not fall into a trap or a place that is already allocated for a different statue. 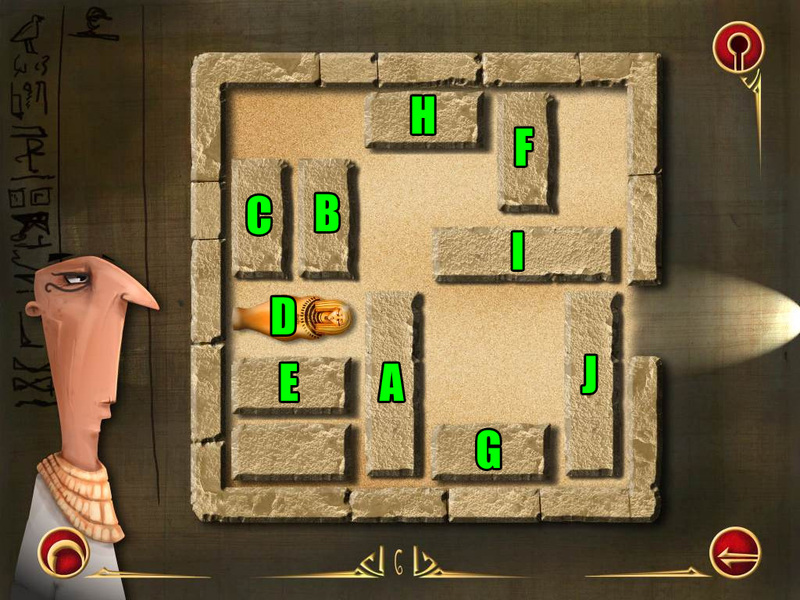 Refer to the screenshot below and follow these instructions: R1 right. B1 left. B2 right. R2 left. Refer to the screenshot below and follow these instructions: R2 up-right-up. B1 up-left. B2 left-down. R1 right. B1 down. R1 left-down-right. B1 up. Refer to the screenshot below and follow these instructions: R2 down-left-up. B2 down-left-down. R1 down-right-up. B1 down-right. G1 up-left-down-left-up. B1 down. G2 right-up. Thanks to Kimberly, Trinn, and Jazz for the walkthrough! I've been playing this game for an hour or so on an iPhone. 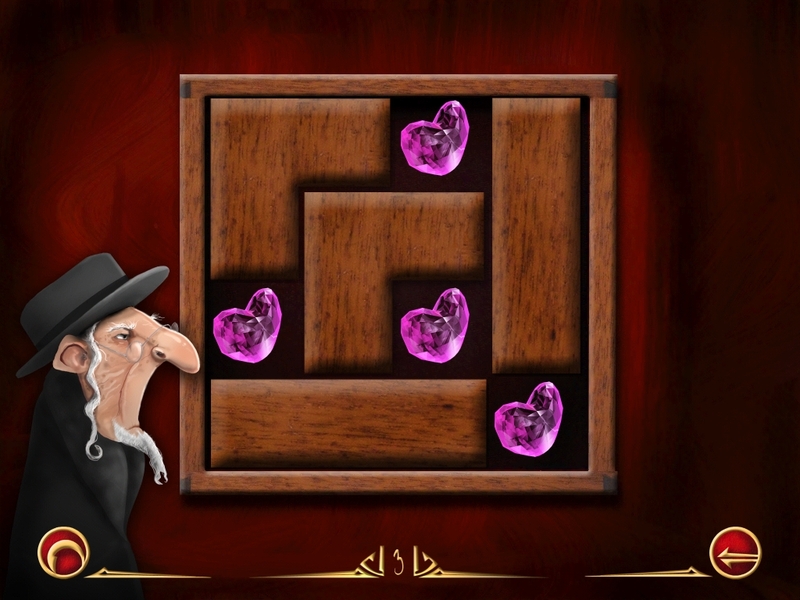 I like the puzzles, but it's a bit difficult to "tap" on the right spot. Especially in the line game. If the touch dynamics were a little less stringent, it'd be a lot more fun! You make a really nice walktrough :) can i make a little request? 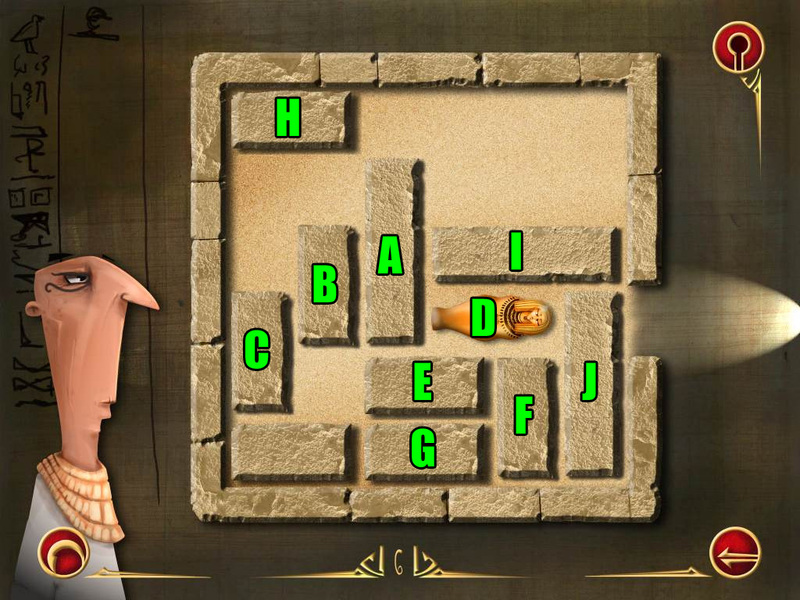 Im stuck on level 3 from paris can u help me with that? Here's what worked for me on Paris #3. You may have to fiddle with the middle couple to make sure they are aligned properly. You really helped me with that :) i finally passed the level thank you very much! Can someone post level 15 Paris. 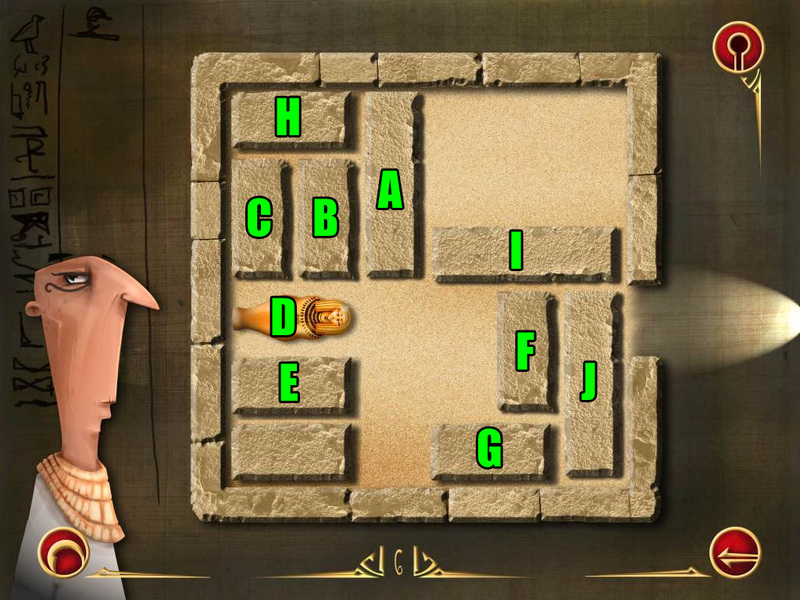 Can somebody please help me with Paris level 10. i put everything the Way it Looked like but no chance. 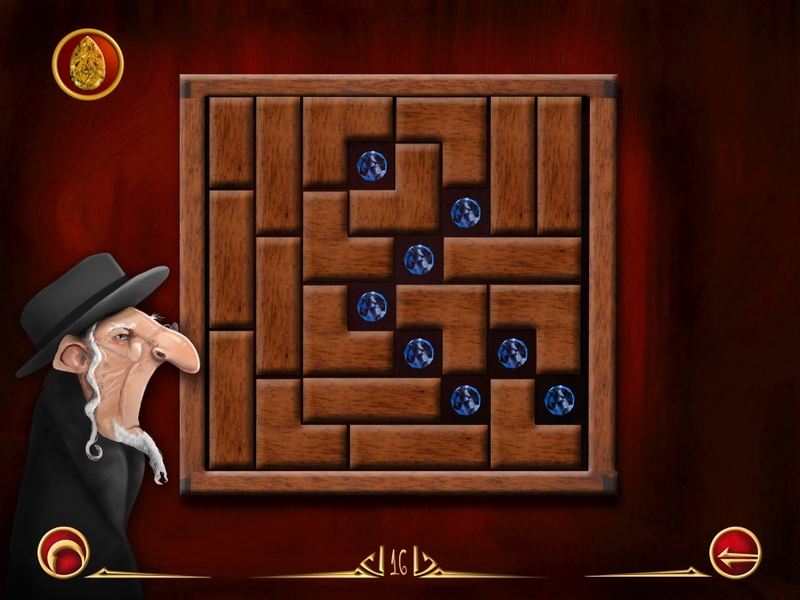 Make sure you have the updated version 1.2 because there was a problem on that level in the original version. I have the New Version but still it is Not working. Any Ideal what i can do? 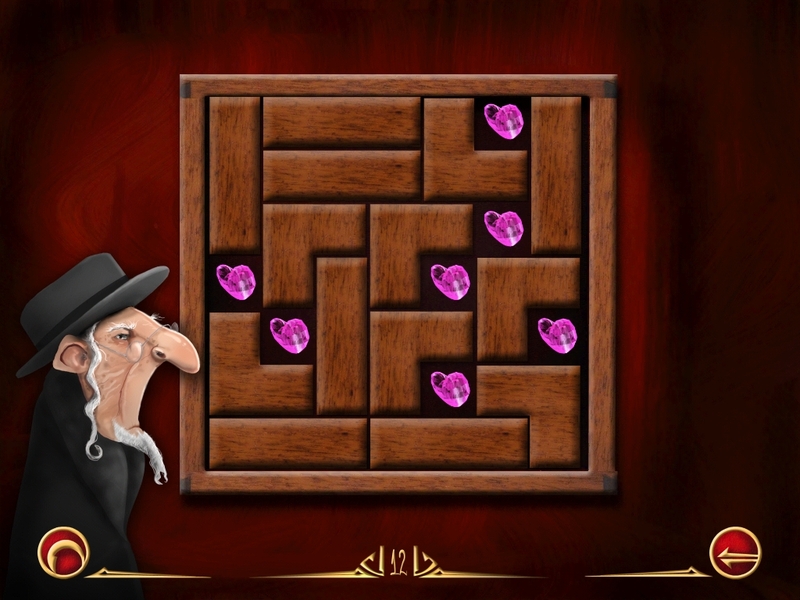 These Paris levels are so exacting, it can get frustrating. I'm currently having the same problem on 9--it looks exactly right, but the game does not agree. If I get to 10, I'll let you know if I figure anything out. This is the order i got so far. For some reason, I'm having a much harder time on Monte Carlo. 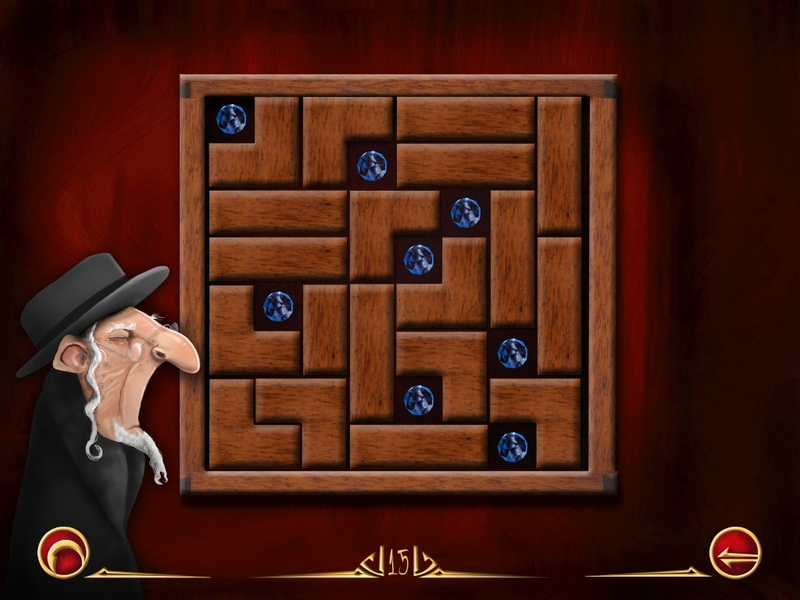 I can't even get past level 2, despite trying everything including starts that don't even look promising. Hi! 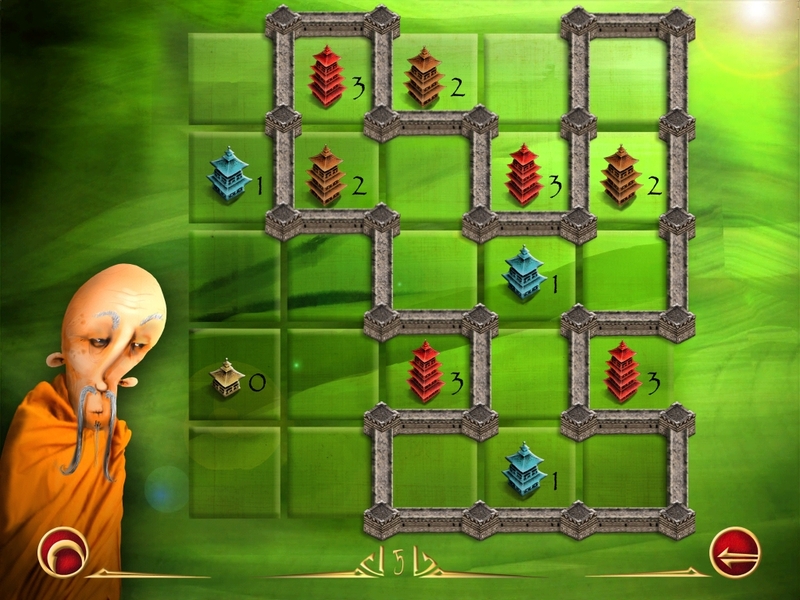 Does anyone know how to achieve the Divine Sign: Build a wall in the shape of the Tian character achievement? Could anyone upload a picture of that? I'm really hopeless :)) I tried anything. The character doesn't translate to show you, so I suggest doing an online search for "tian character" to see what it looks like. 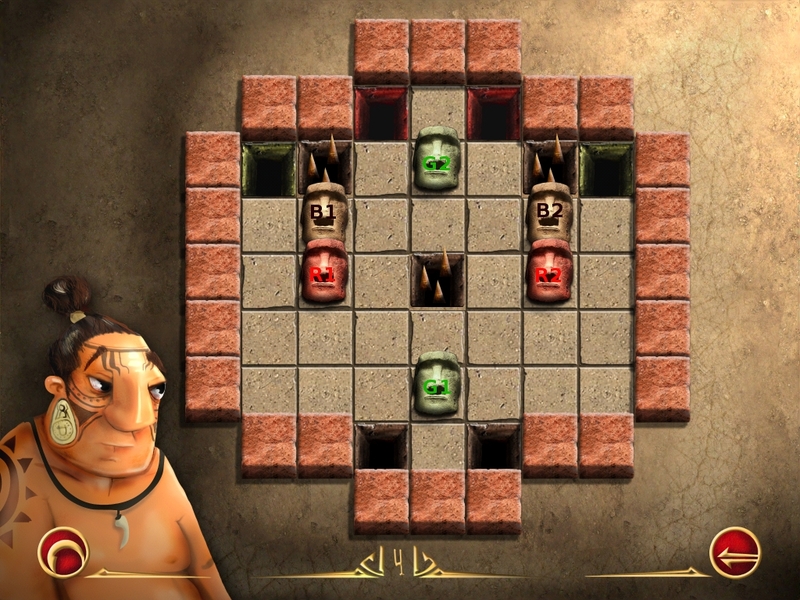 I've been stuck on rapa nui 16 for days. Please help! 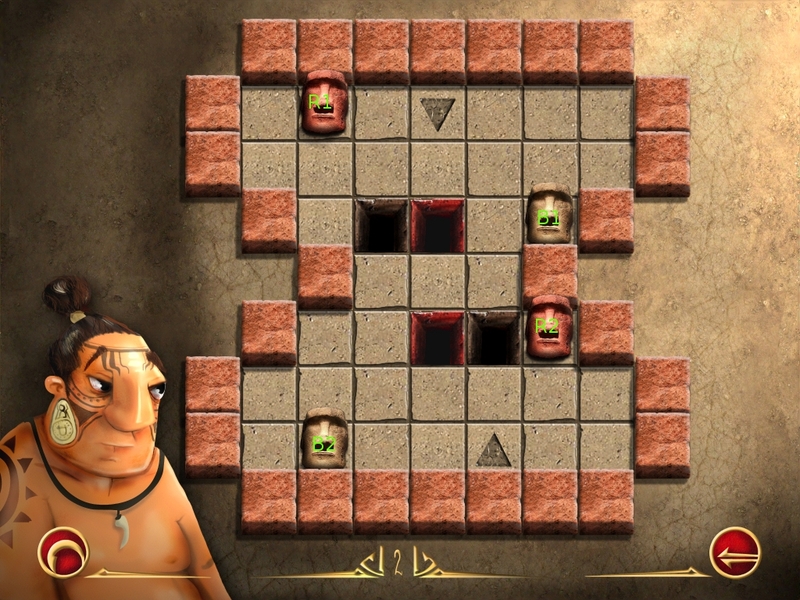 Tragically stuck on Rapa Nui level 16 and Luxor level 11.
really stuck on rapa nui level 5 please help!!!!!! Pull the top green piece up and the bottom green piece down. 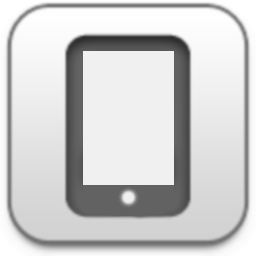 Drag the left red piece to the right and then pull it up to set it in the left red square. Slide the top green piece left and then down to set it in the left green square. 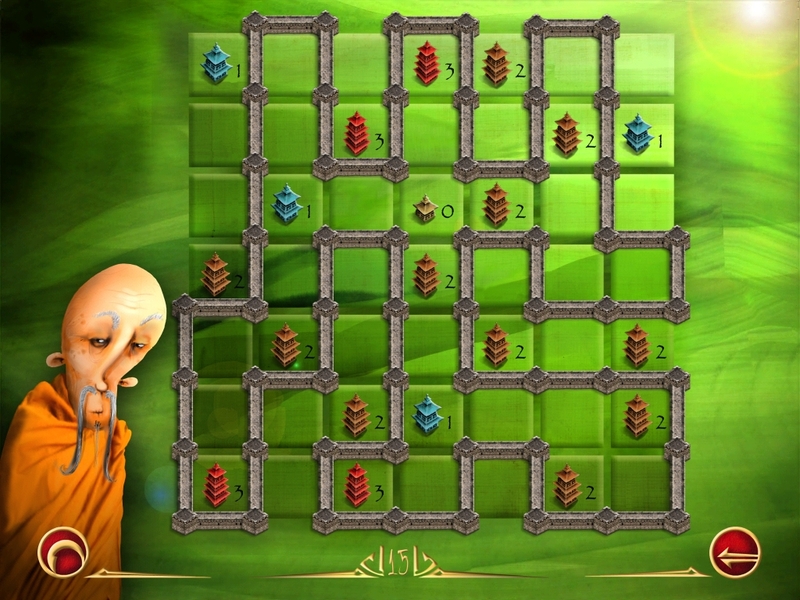 Move the remaining green and red pieces all the way left. Drag the right brown piece to the left and then down so it stops against the top of the red piece, then move it left to set it into the left brown space. Pull the remaining brown piece up, right, down, and right again to set it into the right brown space. Move the red piece all the way to the right. Drag the green piece right and then down to set it into the right green space. Slide the red piece down, left, and then up to set it in the right red space. 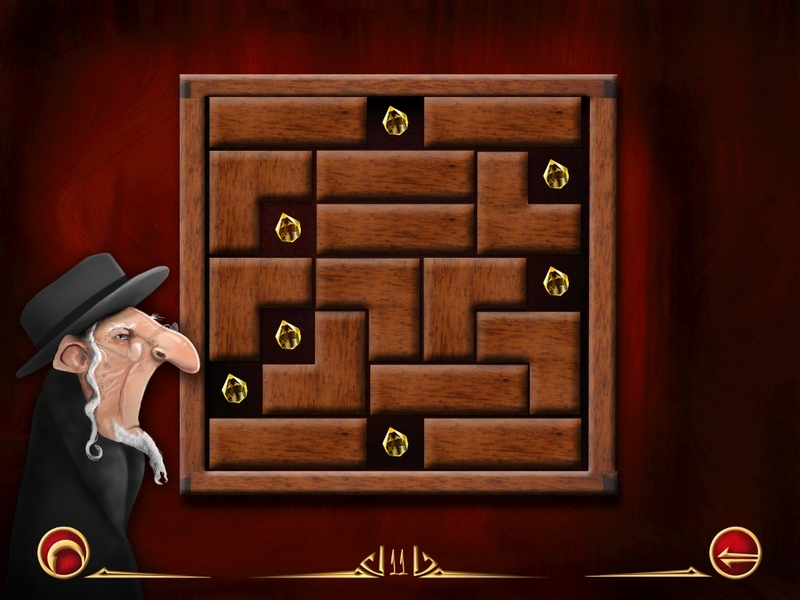 I've finished all the cities...except Luxor because I'm permanently stuck on level 11. Can anyone help? 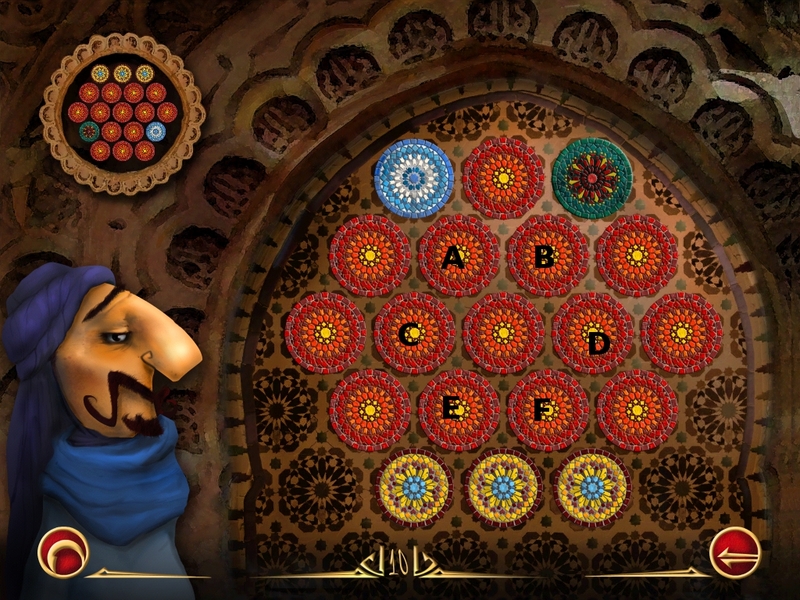 Can anyone show me how to do the Beijing 16,as I've been trying to do this puzzle for three weeks now and still can't get it right. 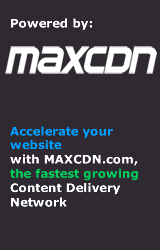 There is a screenshot solution in the walkthrough above the comments. 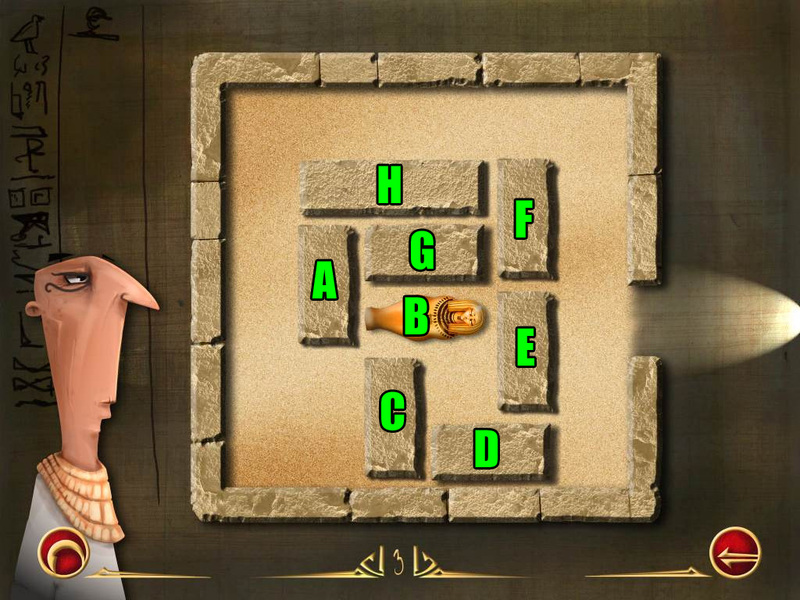 I'm completely stuck on Luxor lvl 13... does anyone know how to solve this one? 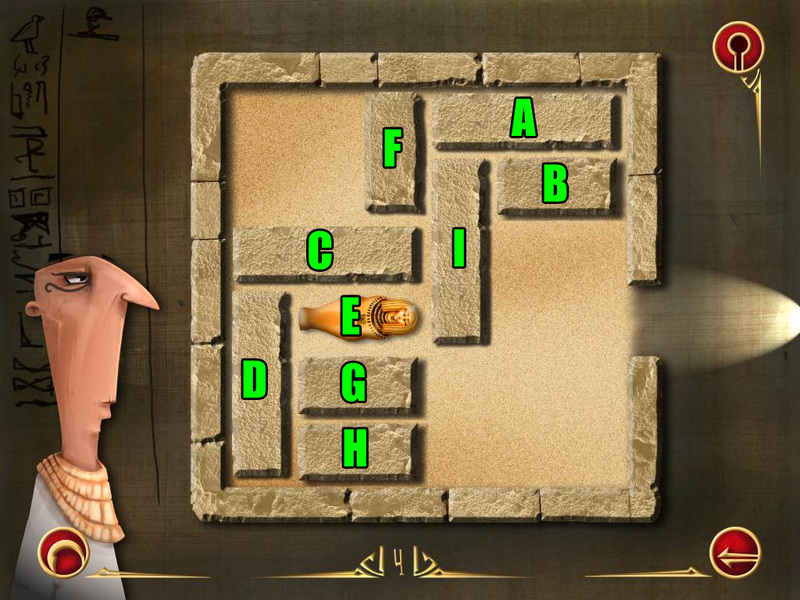 Help needed on egypt level 8 please!!! and was wondering if the walkthrough is going to be completed?? @Hannah: As the game is now several months old, it is not a priority for our staff to finish this walkthrough at this time. However; if any of our readers care to offer solutions to any level not featured in the walkthrough so far, we will gladly update it. Re: Tian character: ? This Chinese character literally means "Sky". 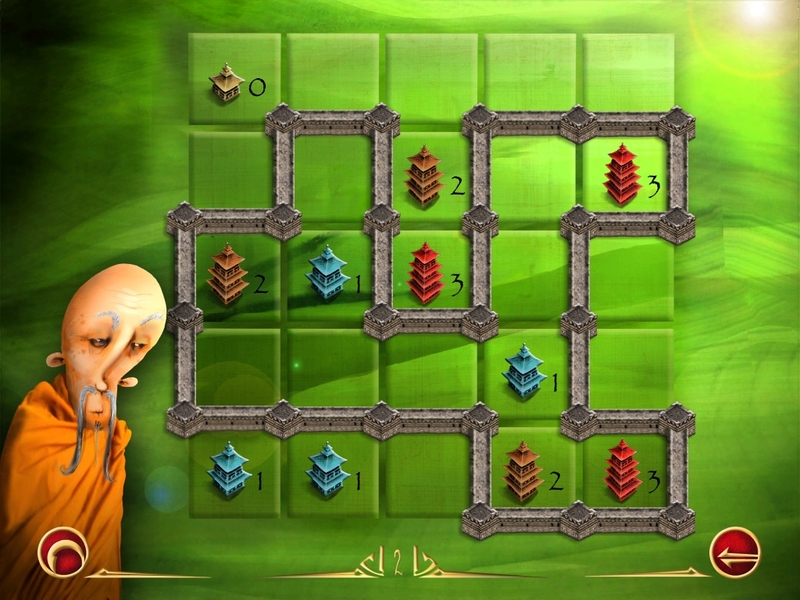 This can be achieved in Beijing level 12. Just build the wall symmetrically in the shape of the above character. But note the top horizontal wall is longer than the second horizontal wall. If anyone needs the full image I may try to upload it later. Hi! 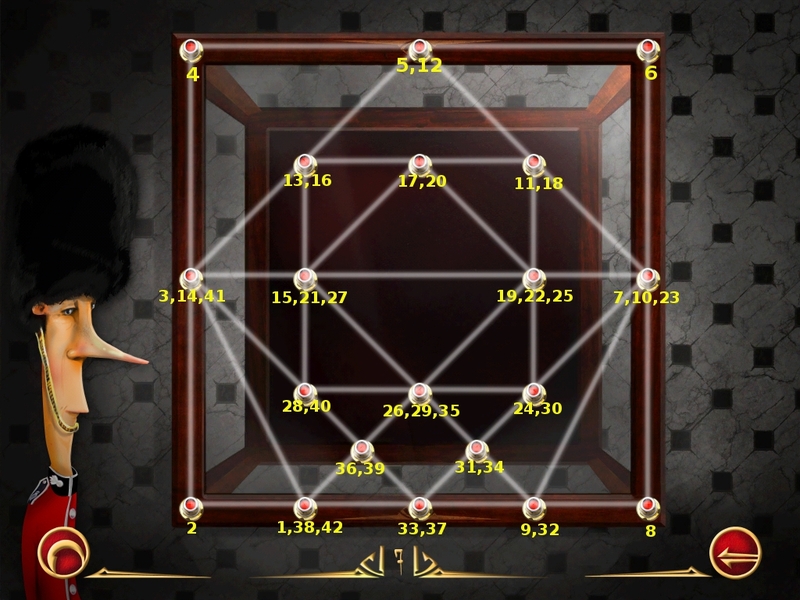 Does anyone know how to achieve the The Winner of Insignia: Find the royal insignia among the laser rays? Could anyone upload a picture?